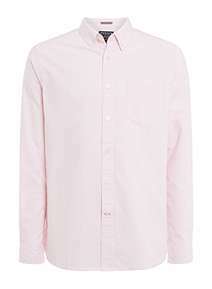 While summer wardrobes gone by may have been all about the t-shirt, for 2019, the summer shirt is taking over. 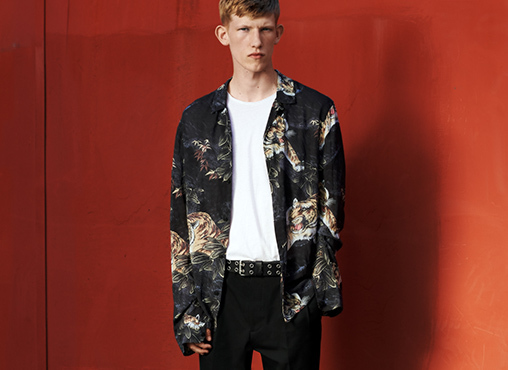 Take your cues from dads in Hawaiian shirts the world over and embrace tropical prints, hot florals and ‘90s tie-dye this year. And for those feeling less adventurous, softer yellows and breezy stripes are also on offer. 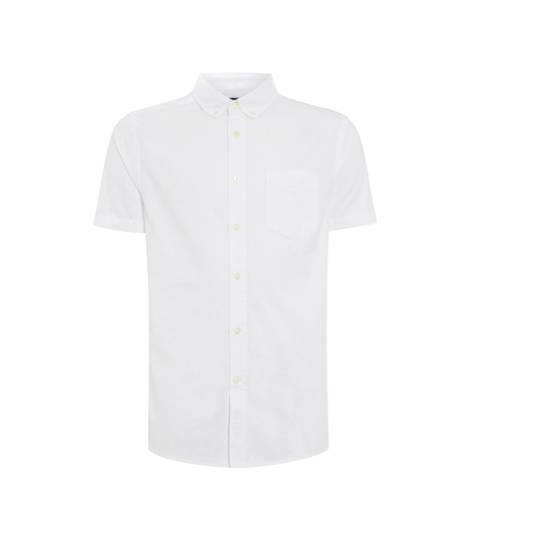 Keep reading for our pick of the best men’s summer shirts that’ll get your warm-weather wardrobe all ironed out. In a deft move, this shirt ticks the retro ‘90s trend, which is officially A Thing this summer, and the uplifting sun-in-a-bottle look is the very reason to wear a summery shirt in the first place. We’re voting with our wallet. 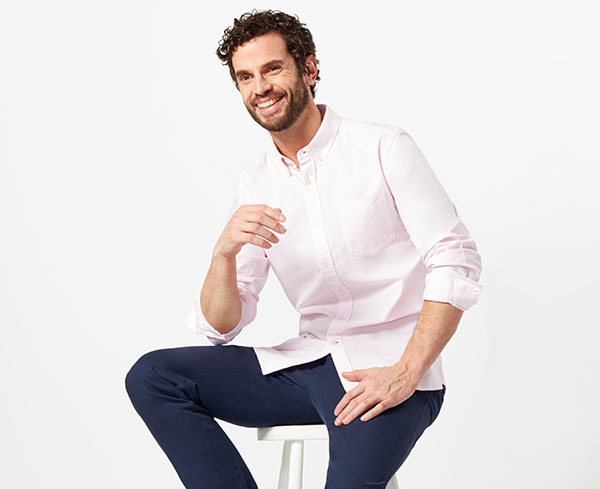 The trick with summer shirting is not looking like every other guy at said festival and no way is that easier than with a printed shirt that’s exclusive to us. 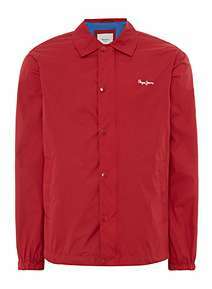 IZOD – the classic American brand – has hopped straight to House of Fraser in a UK only so you can own this shirt before everyone else does. Winner. Striped shirts, carelessly half tucked, or even more carelessly on the baggy side, featured heavily in the Spring/Summer 2019 catwalks. In real life, the trend has a slight tendency to look not so much high fashion as highly forgetful, so we recommend a toe-in-the-water approach to this one. Choose a loose but still elegant striped shirt with a nonchalant granddad collar. The saying ‘fashion is art’ is immortalised in this delightful teal shirt, the print of which could well feature in the fauna section of your local museum – which is always a good thing, trust us. 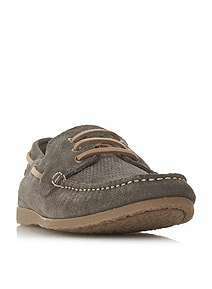 Pair with chinos when you’re working hard and dark denim when you’re hardly working. The patterned shirt doesn’t have to be a weekend-only joy, but rather, add a little printed magic into your daily get-ups with a work-appropriate geometric print. If work itself gets boring, you can always ponder whether your shirt is white with a black pattern or black with a white pattern and other such sartorial musings. Ah, the botanical shirt. The one that slipped from the back of the costume store to Instagram feeds in a matter of summers. Go bold or go home, right? If, like us, you live by that mantra, choose this standout, colour-popping number that’ll make even the ‘gram light up. Everyone’s favourite ‘90s throwback, tie-dye, is back in a big way this summer. If tie-dye itself feels a bit too much then we recommend a touch of ombre which will bring that breezy, nostalgic style to your ensembles in a more sophisticated way. 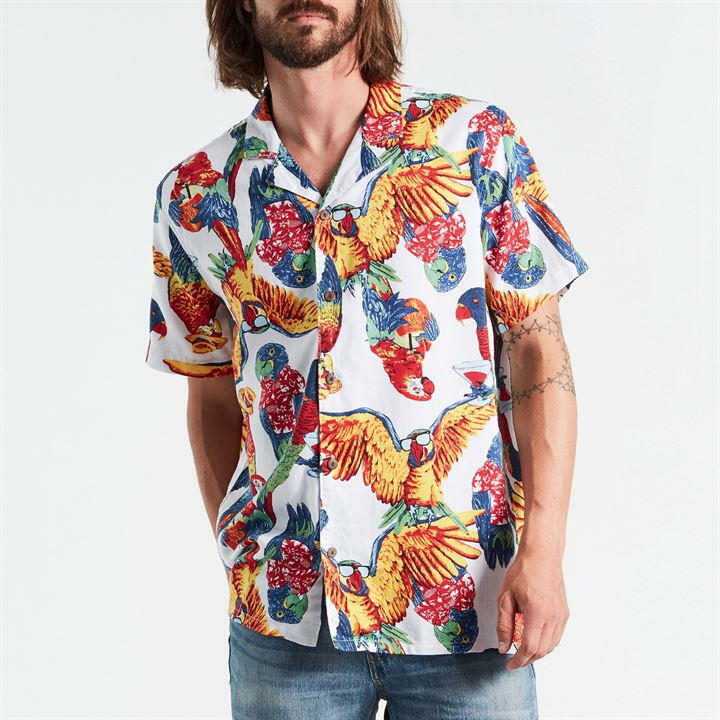 A prime example of the perfect Cuban collar shirt, this Levi’s number is a) bright b) cool c) features a whimsical parrot character which, to be honest, is exactly what we’re looking for in a look-at-me and then look closer statement shirt. Wear on repeat. 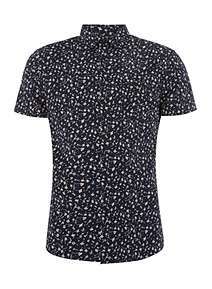 This shirt is your printed shirt but on mute. 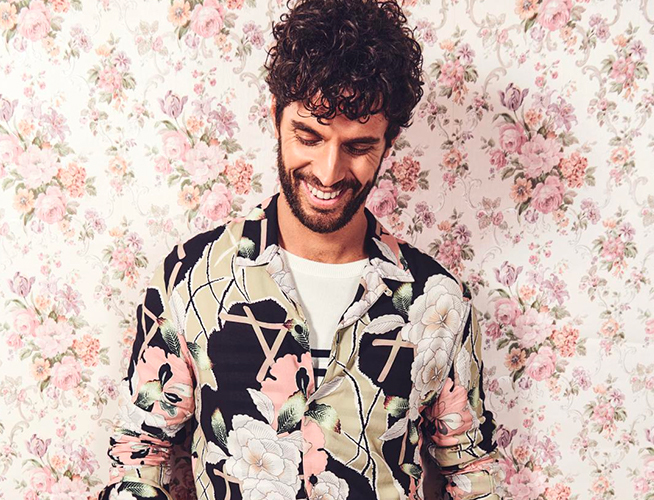 Beautifully toned-down, the painterly flower print is subtle enough for work events but interesting enough that you’ll never be accused of being a wardrobe wallflower. Summer in the office, let’s face it, can be grim. While you may stare longingly out the window, let not your wardrobe be another hot-weather regret by choosing a cool, breezy shirt. A geometric pattern makes going sans tie feel totally natural and can be paired as easily with chinos as with tailored shorts if your office dress code so allows. Never has there been a better time to be a man with stuff. For bags, folks, are having a moment and things have moved on a lot since the days of Joey Tribbiani’s man bag. 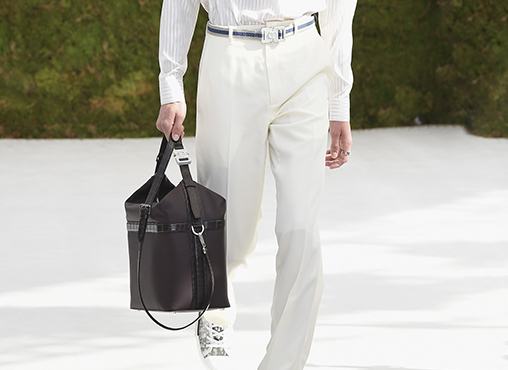 From totes to cross-body bags and lunch boxes, the spring/summer 2019 men’s catwalks were a love letter to the bag – and it’s a romance we’re fully on board with. It’d have been pretty hard to miss the humble bum bag’s meteoric rise to fashion stardom. Now it’s a struggle to go to certain enclaves of town without spotting a bum bag or two. 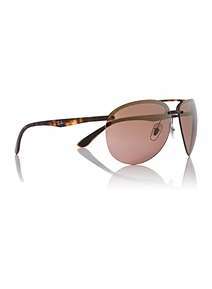 Worn in the traditional way or slung casually round the neck, they’re the quickest way to go from normal to ‘fashun’. 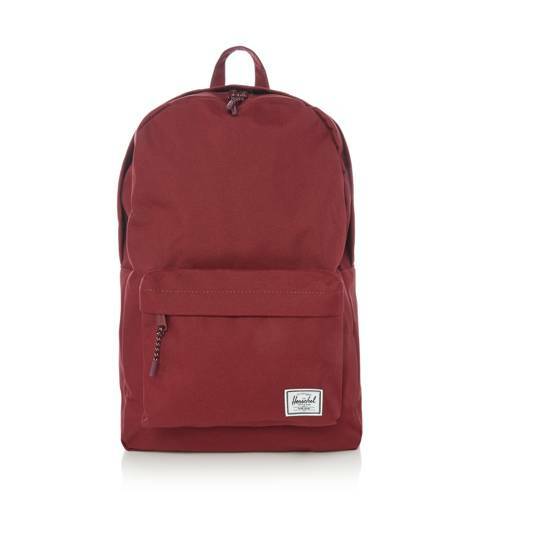 Where once the backpack was school boy’s territory, now it’s a decidedly more grown-up affair. 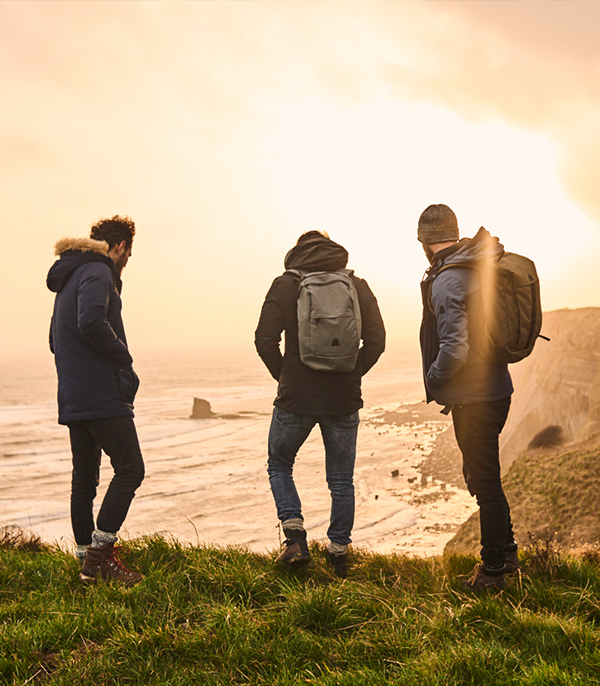 Practical, roomy and surprisingly sophisticated, a sleek rucksack is the modern man’s commuting sidekick. Our hands down personal favourite? A black leather iteration. It doesn’t get more old school, more Hollywood-esque than a suit and a great briefcase. The weighty hardware, the textured leather, the handles… there’s a lot to love about such an iconic piece of menswear kit. Add a long-handled umbrella to get full Gene Kelly vibes. The pouch (or pouchette, muche, murse, whatever you like to call it) has had an official makeover. No longer your girlfriend’s clutch bag, a leather pouch is the sleekest way to carry your clobber and look pretty sophisticated in the process. Fulfilling our penchant for technical gear and neon brights, this North Face backpack is precisely the kind of geek-turned-chic we like. Super roomy for all your gear, it’ll fit everything from your headphones to your gym kit, so you’re sure to feel thoroughly backed up. The spring/summer 2019 catwalks were awash with small cross-body bags. Some, worn high up, had hapless tourist vibes (exhibit A: Fendi) which renewed our enthusiasm for dad-dressing. Get in on the trend now with a retro camera bag. Follow A$AP Rocky, Jared Leto et al and grab yourself a bum bag if you haven’t already. 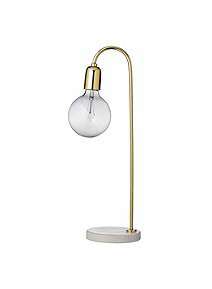 This one’s kind of luxe, kind of flash, which we quite enjoy. It says weekend errands but ‘make it fashion’. Sometimes after the hustle; and pollution; and self-service checkouts; and hurried flat whites, we crave a bit of the countryside. Thankfully, this Barbour beauty will bring a breath of fresh air to your daily tube kerfuffle. Killing two birds with one stone, the weekend bag is a multitasking dream for it’s both a bag for weekend getaways (naturally) and a great gym bag. Nice. With utilitarian, Scandi vibes, a roll top backpack is minimal without being clinical, cool without trying too hard. It may require a bit of extra work getting stuff out of it but the effort is worth it, trust us. In a bit of a fashion evolution, the tote has become bona fide legitimate hand luggage for men. The only thing needed to pull it off? Confidence. 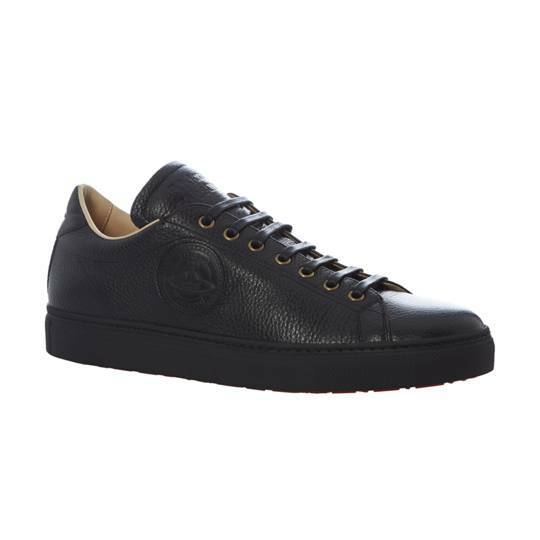 This leather version is super smart and just the right size. We’re sold on it, totes. For a fabric designed to blend in, this backpack paradoxically stands out. 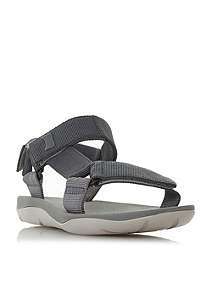 With its retro, grunge styling and cool, functional design, it’s a must for the urban jungle. Tarzan would be proud. The humble satchel has been around in menswear for donkey’s years. It’s got somewhat of a reputation for school kid vibes but use this to your advantage. The cheeky, happy-go-lucky vibes will take you anywhere. As seen on, well, everyone, get in on the brand the Instagram set are sporting now with a messenger bag that feels very de jour. It’s practical, handy and will make you feel like a fashion champ, which is always a good thing. Are you feeling what we’re feeling? The weather’s not great. Holidays feel like a world way. You look at your wardrobe and you’re hit with a sea of old jumpers and the same four colours you’ve worn for the last four years. It’s all, well, a bit bleak. So this new season, we’ve decided to put the spring back in our step. Amazing suiting, print clashing and more, we’re forming an anti-minimalist movement to put the fun back into getting dressed. We recommend you join us. Menswear is having a quiet re-evaluation. After seasons where the buzzword on everyone’s lips has been ‘streetwear’, for Spring/Summer 2019 ‘craft’ and ‘haute couture’ are starting to be whispered. The epitome of old-fashioned elegance, the suit dominated the shows. 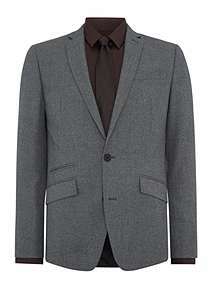 Even designers known for their casual collections dabbled in tailoring LIKE WHO. Neon suits, head-to-toe pastels, oversized double-breasted jackets, you name it, it was on the catwalk. 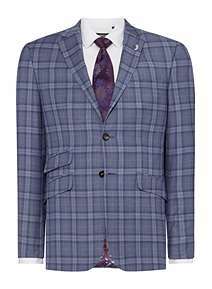 Print clashing also remains a key trend, with the likes of Versace and Valentino leading the way, we’re adding it to our suiting wardrobes. Our key takeways for the season? Fun, maximalist and elegance rule supreme. The key to our mantra this season is it’s never too much. 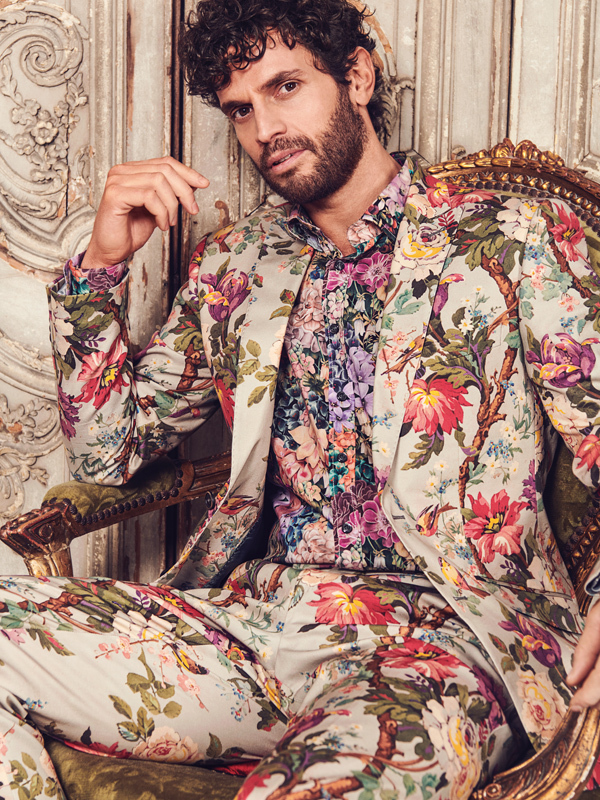 For smarter occasions, pick a floral suit and pair with an even more botanical shirt. 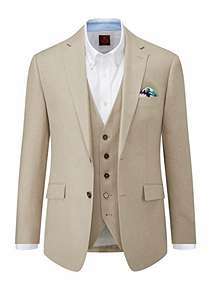 Alternatively, go for boldness in the colour department with a two piece suit in a full-on tone – a rusty red, an olive green or a pastel which feels thoroughly on-trend for this season. 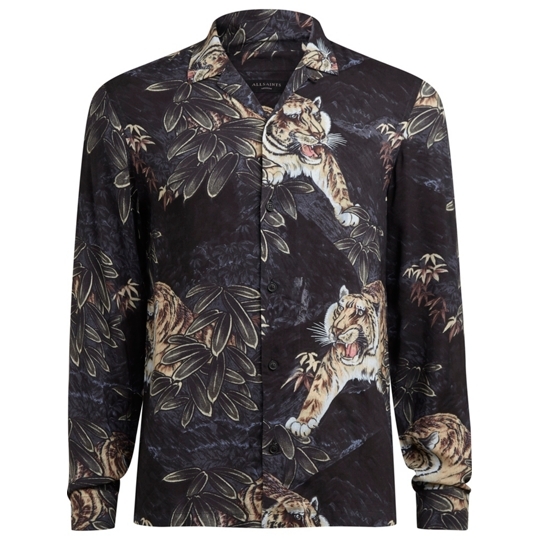 For smart-casual, go for an amazing printed shirt. 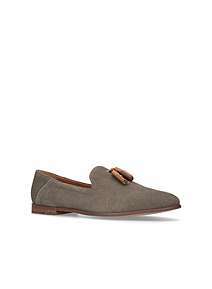 Dress it down by teaming with relaxed joggers or up with checked suit trousers cut to show off a great pair of loafers. In all your ensembles, think popping. Take a simple tee a step further with a standout graphic; for a shirt, go bright; and for a work look, pick an amazing clashing tie. Remember, it’s only OTT when you say it is. 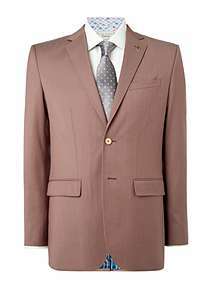 Skopes Milo suit jacket £90 / trousers £45 COMING SOON. 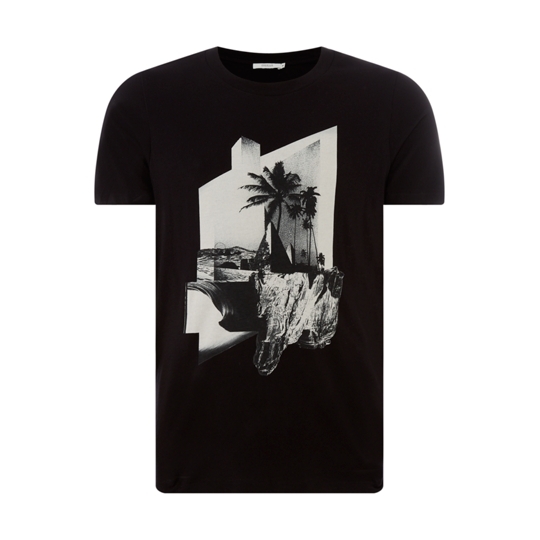 Diesel T-DIGO-YA t-shirt £45 in-store now. We recommend wearing a trench this spring. Suave, sophisticated and with pastoral vibes (see the Ami catwalk for style notes), it’s spring’s answer to being warm but not too warm. 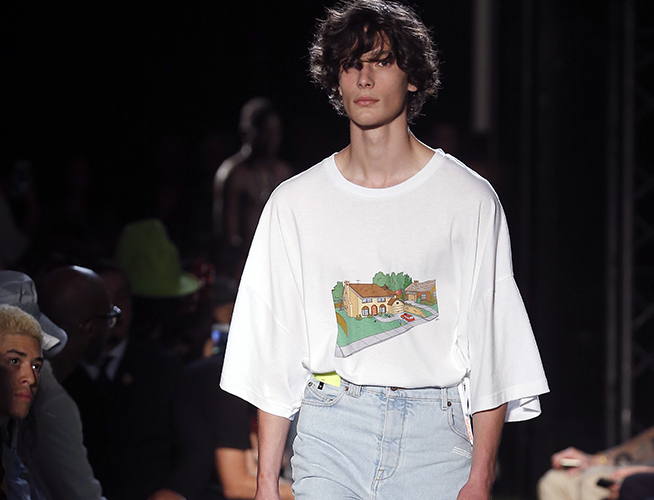 For SS19, shirting took an unexpected turn. Breezy, Bengal-stripe shirts, half tucked, and artisanal, billowing checked shirts took to the stage. 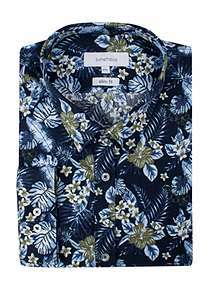 Our favourite – boxy Hawaiian-shape shirts in updated prints – also made a (welcome) appearance. 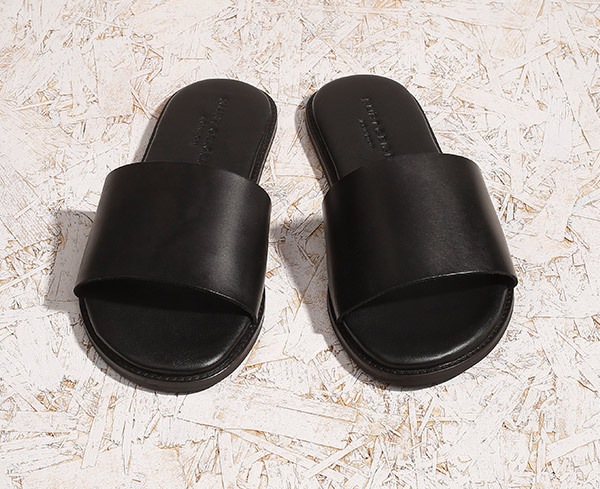 Rather than shaking off the embarrassing-dad-on-holiday connotations, dadcore is precisely why you should wear sandals this season. Chunky sandals are our particular variety of choice, as seen at MSGM, Wood Wood and Fendi. Dressing for a date can be a troublesome affair. In all of life’s occasions that involve first impressions, dates are up there with the ones that count most. So to make sure you walk into your next date worry-free, follow our guide to date night dressing – whether it’s the first encounter or the umpteenth. Perhaps the most nerve-wracking of them all, the first date is filled with a lot of unknowns. One thing’s for sure though, when it comes to outfitting for multiple possible scenarios, playing it classic and understated is a good bet. The key is to look pulled together but still relaxed, effortless rather than trying. 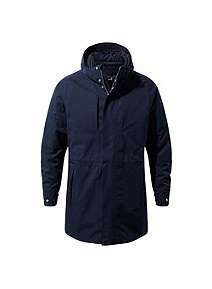 If your meeting involves some kind of outdoor escapades, we recommend a clean-line parka. For a day date or coffee, a flannel shirt layered over a roll neck top works well. For evening drinks, a great light knit or an Oxford shirt. Bottoms-wise, it’s hard to go far wrong with denim. For more casual settings, choose light or distressed denim and minimalist sneakers. For after-dark rendezvous, go for dark denim and boots. Actually, that wasn’t that daunting was it? Having got this far, you can now have more fun with your dating wardrobe. Show some personality but remember to keep it approachable and appropriate to whatever activity you’re undertaking. 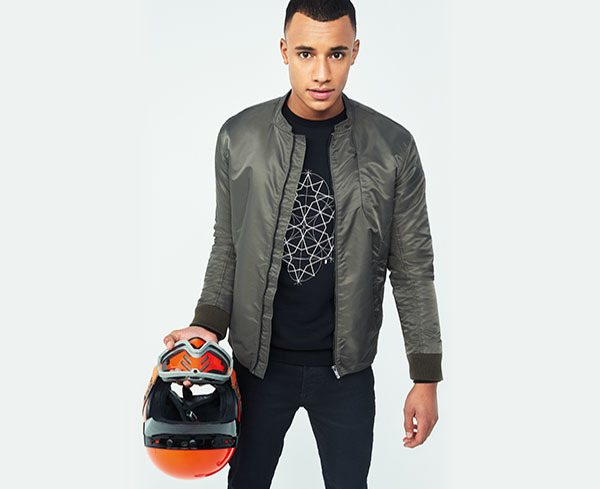 A nice bomber jacket, printed shirt and tapered trousers would suit cool, swankier places. 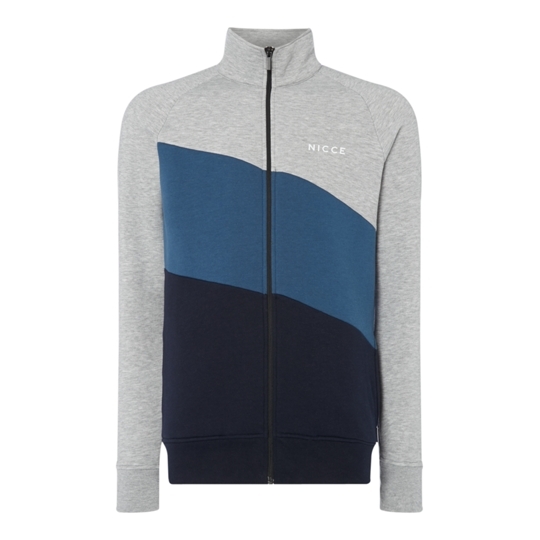 A trendy quarter zip-up, jeans, trainers and chunky socks would work for a meeting that might involve a whole day of gallivanting. 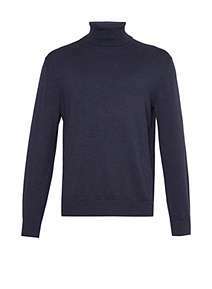 The polo neck has got that retro, cool vibe. Team with a great overcoat and tailored, herringbone trousers. Date six? We think it’s a given. Now here’s the one where you want to actually demonstrate you’re making an effort. Start with grooming. Hair, nails, a great scent, and build your outfit from that. For such an occasion as this, we recommend looking a little fancier than normal. 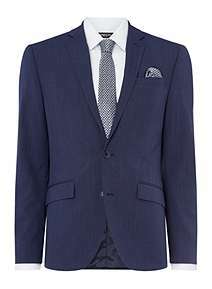 Go for a grey suit jacket, simple tee underneath and suit trousers cut just above the ankle with box-fresh trainers, or a close-fitting, heritage three-piece suit with brown brogues. Save your whimsical tie for the office do and leave your work outfits at home. This is the time to look serious but not like you’ve just run straight from a pile of paperwork. Opt for suave and classy and just by your outfit, you’ll show your partner what the occasion means to you. Designated date night? When you’ve been with your partner for however many years, we suspect they’ll know your wardrobe inside out. So the key to date night dressing is to whip out something new. Think luxury and great quality fabrics. A beautiful charcoal blazer, a great watch, fancy but not kitsch loafers. Bring out a new investment – paired with a refined, coordinated ensemble – and you’re on to a winner. Surprising your partner is always a fun start to designated together-time. Wardrobe-wise, we think we’ve cracked it. 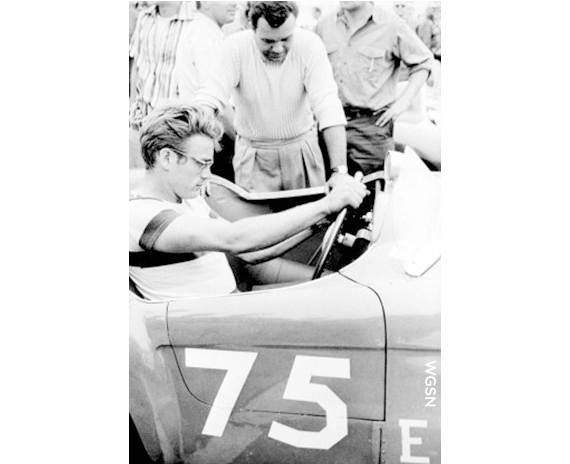 The King of Cool wore everything with confidence. 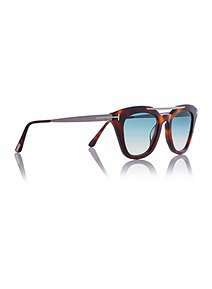 His casual looks oozed a nonchalant appeal, and smart outfits looked polished but - with the addition of his perennial Persol 714 sunglasses - also carefree. 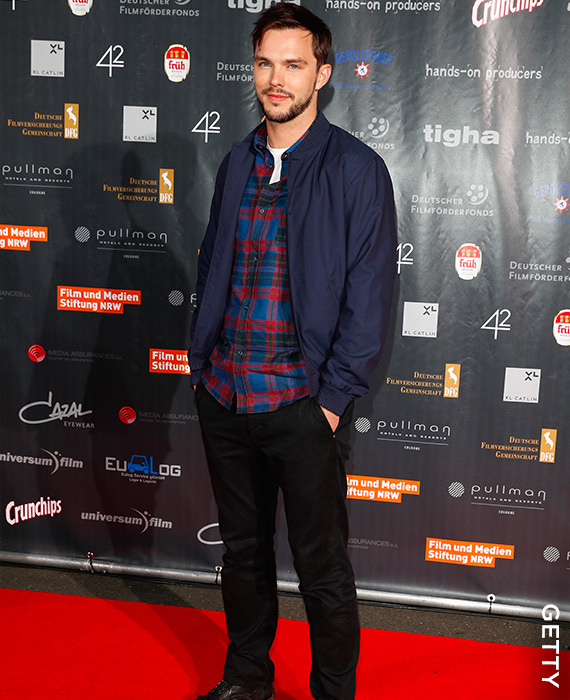 His style favourites included neutral chinos, bomber jackets and desert boots. Everything had a clean-lines feel - pared-back and unfussy. So what can we learn from the man? 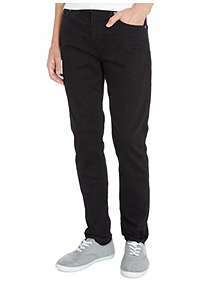 Invest in great basics. Make sure they fit well, keep colours neutral and mix and match for a wardrobe that always speaks of unassuming sophistication. Style notes: Three-piece suits in greys and checks, double denim, turtlenecks and blazers and, of course, a killer pair of shades. 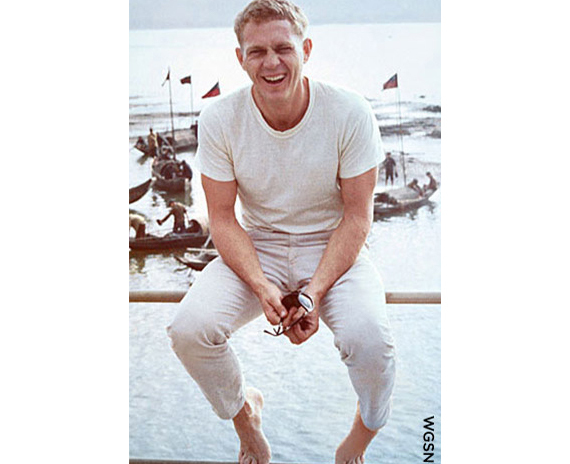 The legendary Hollywood actor is forever remembered for his effortless cool and the power of a great white t-shirt. 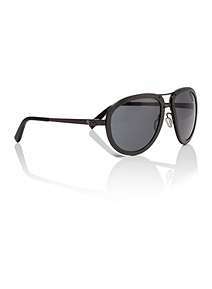 Paired with jeans, rugged boots and tortoiseshell shades, it’s a timeless look that’s remained cool ever since. The red Harrington jacket he wore in Rebel Without a Cause has become iconic in itself. To channel a piece of James Dean’s undeniable cool, pair a black roll-neck with dark trousers, or a plain tee with a leather biker jacket. Style notes: White tee, rugged jacket, biker boots and thick-rimmed shades. On top of a stellar fashion career and too many collaborations to count, Nick Wooster is an undeniable style icon. With his instantly recognisable silver hair and groomed moustache, he’s become an Instagram and street style favourite. 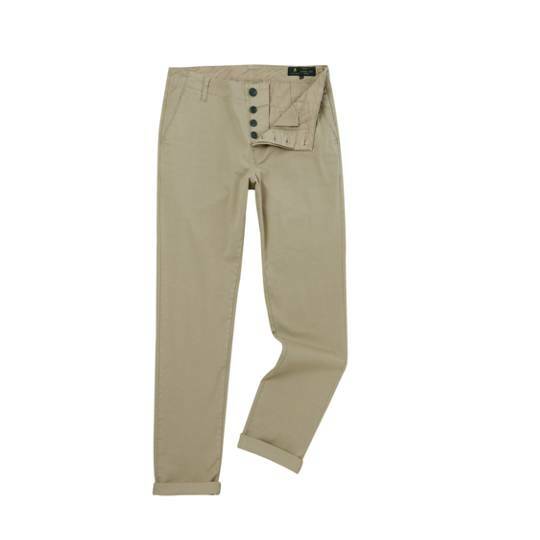 His signature style is a tailored, smart top half and casual bottoms. 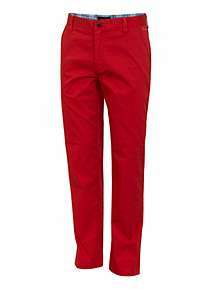 Think a blazer, shirt and tie with colour-popping chinos or relaxed, ankle-grazing trousers. In the same vein, he is known for his blazer and shorts combo. The result is a smart, playful and confident look. He’s not afraid of colour and pattern, and rarely does he step out without some rule-breaking but effective surprise in his looks. Style notes: Shorts paired with suits, military accents, varsity jackets, pops of colour. David Beckham has remained a style icon for years. 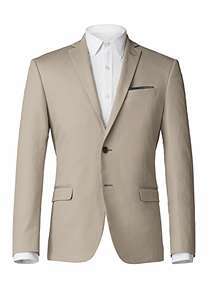 He has universal appeal – women swoon, men respect – and an innate ability to pull together an outfit with ease. For casual, he nails layering – shirts worn open over tees, jumper tied around the waist – and denim. 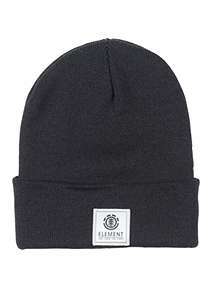 His favourites include leather jackets, simple tees and of course, some kind of hat like a beanie or flat cap. His choices are classic but slightly undone. His shirt will be pulled out from the bottom of a jumper and he chooses distressed jeans and hard-working biker boots, which all give a rugged, masculine look. For formal situations, he always pulls it out of the bag, sporting a suave, well-fitting suit. 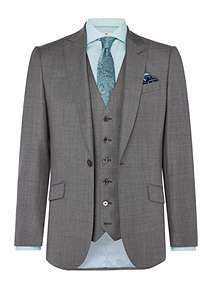 In a pioneering moment, his Royal Wedding get-up has got us all reaching for our morning suits and slim-fitting grey waistcoats. Style notes: Hats, slim fit jeans, denim shirts and boots. 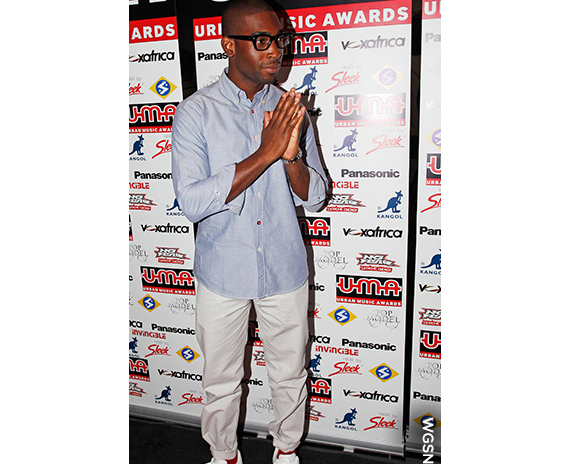 Since he burst onto the music scene, Tinie has carved a reputation as one of the best-dressed men in the country. His great sense of taste means he always look perfect for the situation, pulling it off with effortless flair. He’s inspired us with his mix of Saville Row tailoring and streetwear, his statement patterns that don’t look OTT and his oversized, luxe coats. He doesn’t need to wear glasses but they’ve become his trademark. 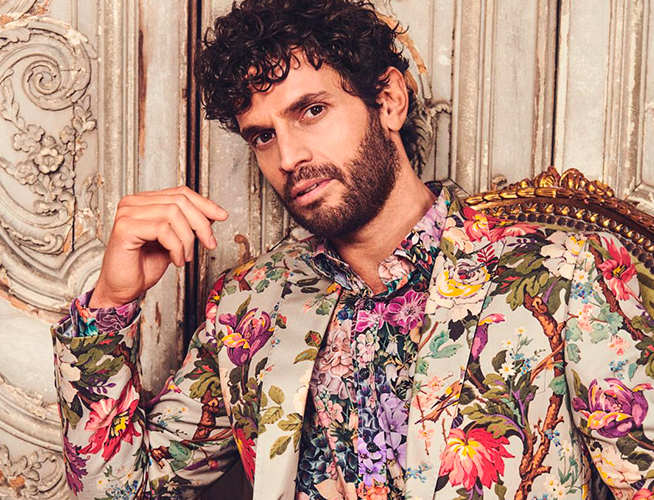 Ambassador for London Fashion Week Men’s and founder of his own label What We Wear, he’s got a strong fashion repertoire and consistently comes out with looks that stretch the boundaries of menswear. Tinie, great job. Style notes: Blazers, great watches, eyewear and stellar trainers. Gone are the days of strict formalwear etiquette. Today, a new breed of occasion ensembles are emerging as the top choice for fashion-forward partygoers. Here we pay homage to the new ways to do occasionwear that freeingly throw the rule book out and offer options aplenty. Formalwear nowadays doesn’t automatically require a suit. Instead make separates your go-to. 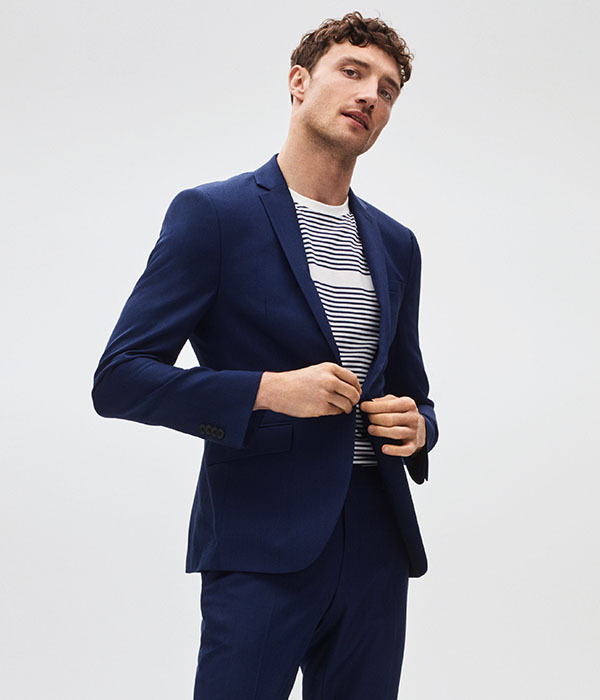 Swap your suit jacket for a standout blazer or your suit trousers for chinos. Alternatively, de-construct your three-piece- pairing just the jacket with deep blue chinos and a tee; the waistcoat with stone trousers and a slim-fit shirt; or the trousers with a herringbone jacket. Sportswear and streetwear is such a continuously big trend. 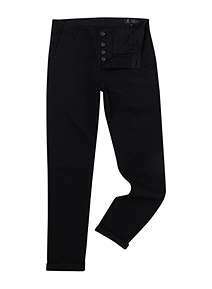 Formalwear today can mean athletic inspired trousers- think black or navy with a colour-pop stripe. 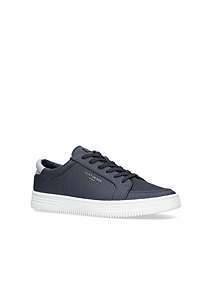 It may seem a no-no but a great pair of squeaky-clean sneakers teamed with suit trousers cut just above the ankle is a totally acceptable, fashion-forward option for relaxed dos. 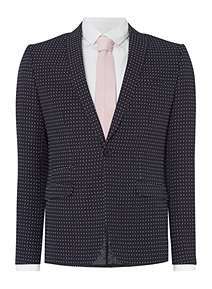 Checked suits are key this season – both larger checkerboards and mini, subtle checks. Similarly, prints are huge. From the standout Hawaiian shirt trend to the understated printed suit trend, plain doesn’t have to be your only option. 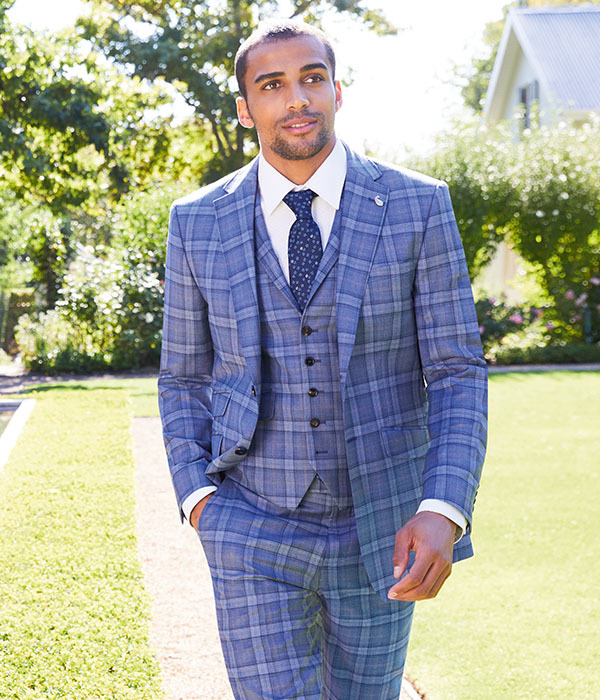 Suits in varied colourways are really on trend for spring and summer. Whether it’s electric blue, saccharine pink or mustard yellow, there’s something instantly celebratory about coloured suiting. If you’re more of the understated type, don’t forget neutrals. Stone, sand and cream all have an innate Italian sensibility about them. And, if you're going for neutrals, don’t be afraid to choose linen. Keep the shapes tailored and it’ll look chic and distinctively summery. The days of strict footwear etiquette are behind us. While some occasions may demand you stick to the age-old rules – traditionally you pair the colour of your sock to the colour of your suit trouser and the smarter the occasion, the thinner the sock – nowadays your feet can be the opportunity to show your fashion metal. 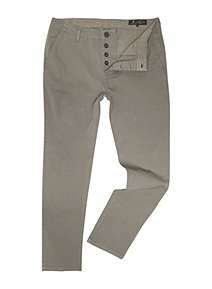 Choose slim-fitting trousers that sit just above the ankle and pair with loafers or brogues, going sockless. In the same vein, your accessories are a chance to show some personality. A whimsical, printed tie can add edge to an otherwise standard outfit – either make it a statement or keep the colourway the same but pick a pattern that clashes with your suit. Instead of cufflinks, think of sunglasses and a great watch as your new occasionwear essentials. 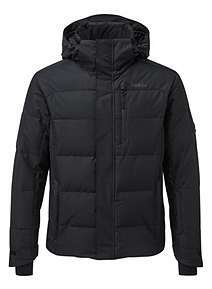 Serious, outdoorsy outerwear has been key this season and last. 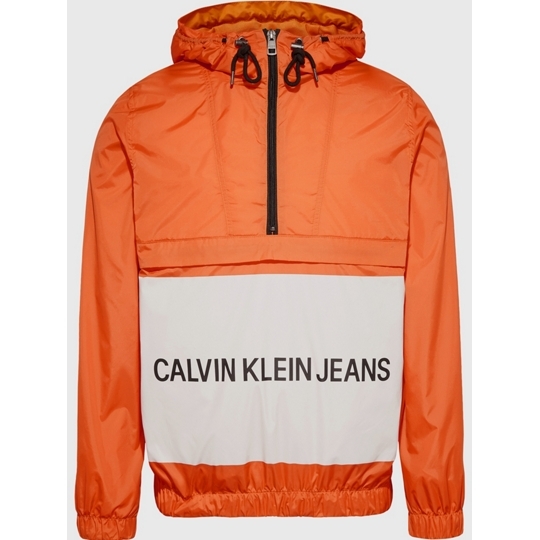 That colour-popping cagoule is now your coat de rigueur. Go for a high-performance puffer and pair with hiking boots or choose a neon windcheater and nail the luxe sportswear trend at the same time. 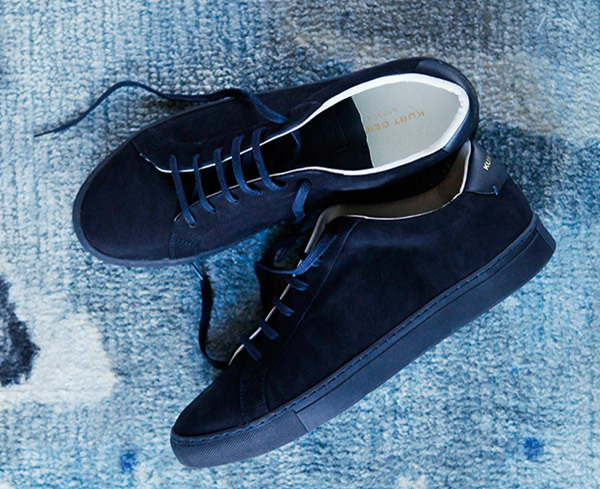 The humble trainer has become menswear’s biggest story. Collabs, exclusives galore… they’re a collector’s item. If you’ve spied that great pair, just buy them. They’re the footwear you can easily become most obsessed about, and they’re totally acceptable for work and for events with a sharp, slim tailored suit. 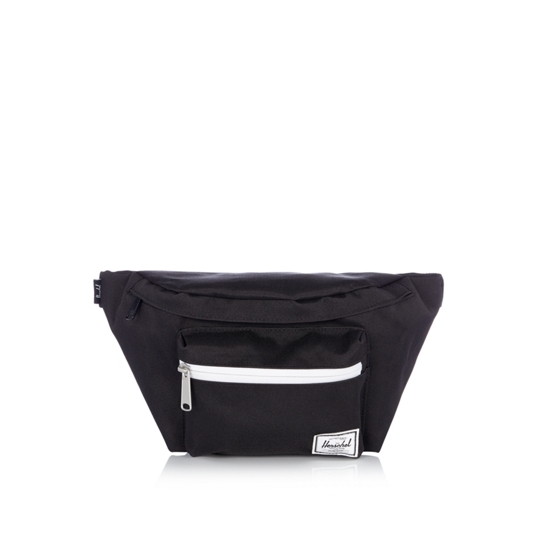 The 90s trend is epitomised in the bum bag. It's had its fair share of bad press in the past so bum bags now have a rebellious, too-cool-to-care vibe. Best paired with an oversized tee and boxy jeans, they also serve the purpose of storing all your necessities without the need for pockets. The easiest place to be daring? The t-shirt. 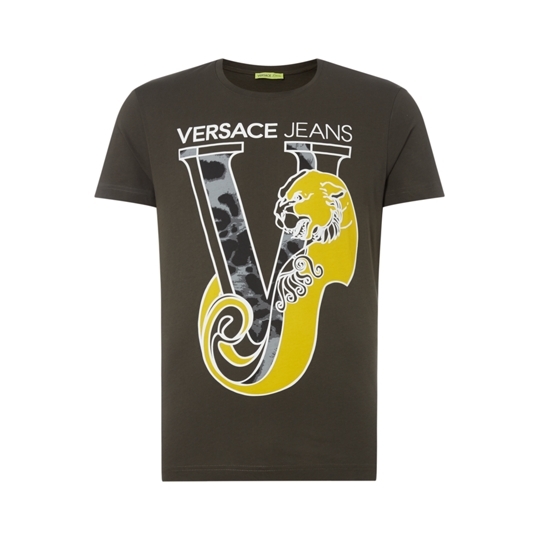 Opting for a graphic tee in a nightly hue is a great way to ease in to the look. Otherwise, go all-out with a statement photographic print or a look-at-me neon, which was all over the Autumn/Winter 18 runways. Showing your brand loyalties is now actively encouraged. Gucci and Versace are all masters in the more-is-more name drop. If you’re worried it’s too much, don’t be. Name-checking is now super luxe. Prints are literally everywhere and if you thought they were just for summer, think again. Darker florals and paisley prints are ideal for autumn. Wear open with a white tee underneath or buttoned up with a leather jacket to channel a little Fight Club vibes. The jeans your dad would wear when doing DIY are now very cool. 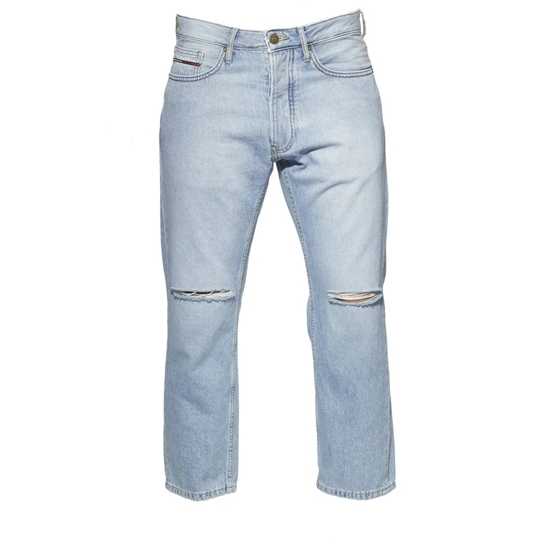 Think boxy, loose fits, a light wash and optional rips on the knees. 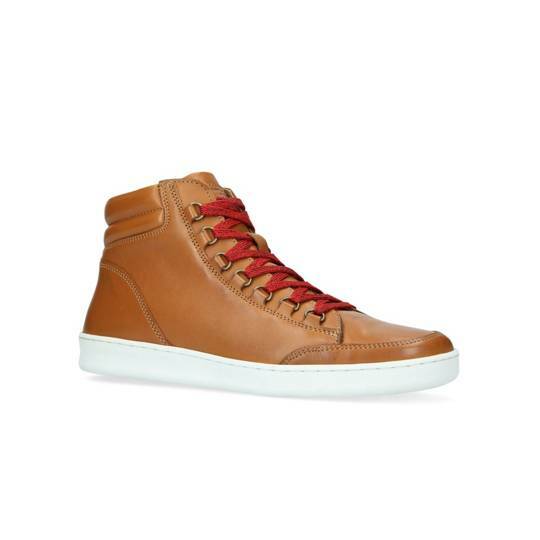 The cut must show off some ankle and your stellar pair of sneakers. 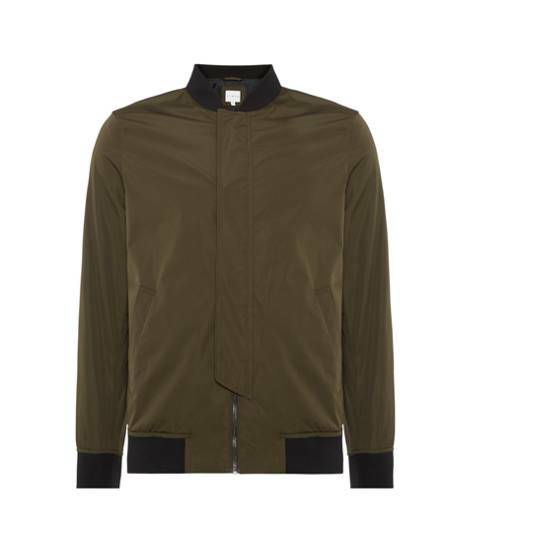 Sportswear and streetwear have been one of the biggest influences on menswear in recent years. Think back five years and tailored tracksuit trousers for work weren't even a thing. Intro a little of the trend into your wardrobe through an athletic sweatshirt that you don’t just save for the gym. Ever dreamed of being an Arctic explorer, trailblazing with your husky dog? You're in luck this year. Shearling triumphed on the AW18 catwalks along with leather, its cool counterpart. 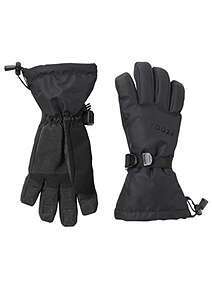 Wear with ski pants and boots, or worn-in jeans and trainers. Utilitarian continues to dominate on the catwalks. Where you once would have been embarrassed to be caught in your handyman get-up, now it’s a look to translate into your everyday wear. 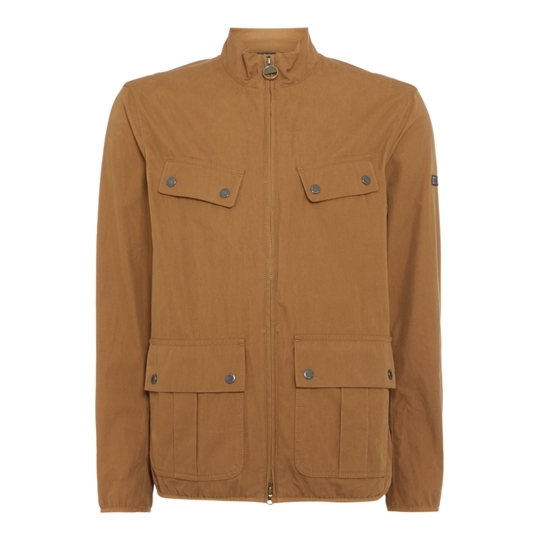 Go for a hardwearing khaki jacket, cargo pants and heavy-duty workwear boots. Summer is finally here and with it the chance to free our feet, but what shoes should you be donning when the mercury rises? From loafers to sliders, we’ve got every eventuality covered with our pick of the best summer shoes. You’re welcome. 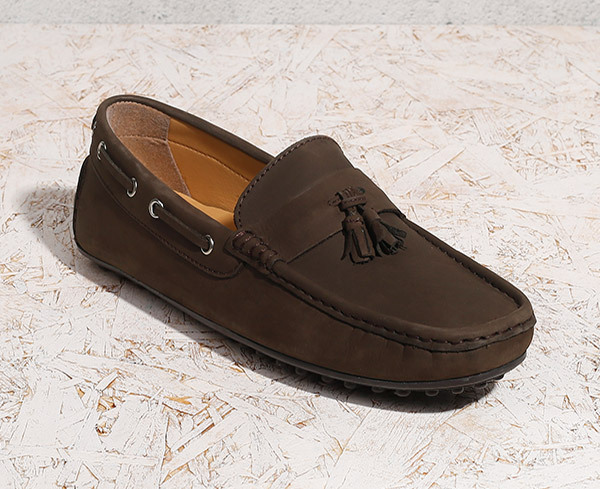 Inspired by the shoes of Norwegian fisherman, the loafer first made its way onto the scene back in 1936 and has since become the go-to shoe for everyone from Palm Beach holidaymakers to the Ivy League set. 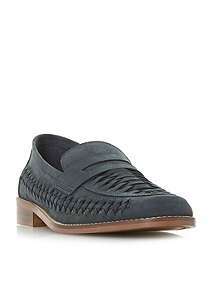 Today, the loafer immortalises relaxed, summer workwear. 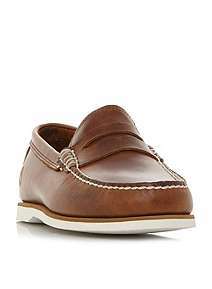 Wear sockless with chinos or suit trousers cut just above the ankle and dress with a slim-fit shirt for easy smart-casual. Ah, the trainer. The granddaddy of the footwear world has a strong place in our hearts. 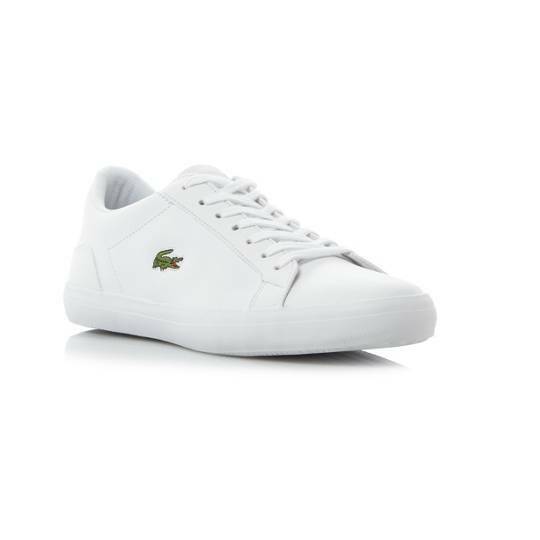 While not confined to summer, trainers are perfect for the unpredictable British weather and go with anything, from shorts to jeans to suiting. Graduate to sneaker head status by investing in a collection, and if you find a pair you love, buy two so you have a box-fresh pair ready when one is looking a little less than perfect. If there’s one piece of footwear that’s gone from no-no to high fashion status, it’s the pool slider. In 1972 Adidas introduced the Adilette in response to the German football team’s need for a shoe for the showers and changing room. The shower shoe – as it was called – became popular with sports teams but when Mark Zuckerberg was depicted wearing them in The Social Network we started to think differently. Now, after a run of catwalk appearances and an iconic Gucci iteration, sliders are back in fashion. 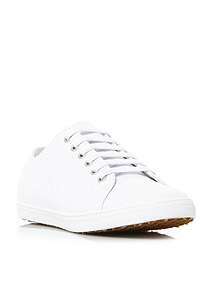 Pair with loose, relaxed trousers and wear sockless – unless you’re feeling really daring, in which case pair with ribbed, white socks and be prepared to be papped by street style photographers. 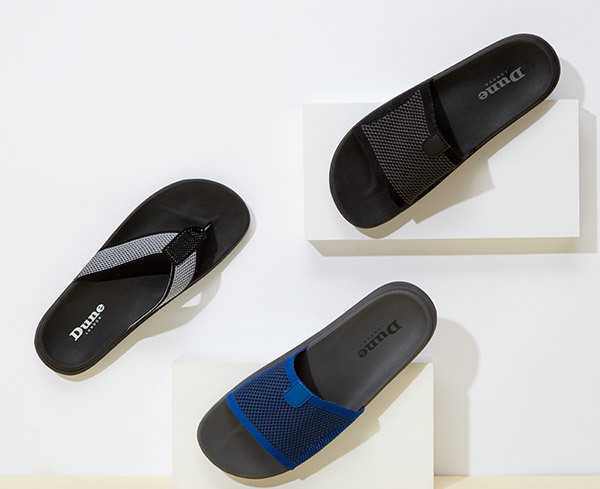 Originally dating back as far as Ancient Egypt, our modern flip flops are in fact a rubber version of the Japanese sandal, the zori. 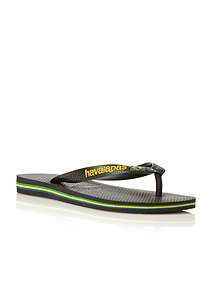 Growing in popularity in America after World War II, flip flops – so called because of the sound they make when they slap the floor – came to epitomise Californian beach style. No longer reserved for holidays, these days they’re just as at home in the pub as they are by the pool. 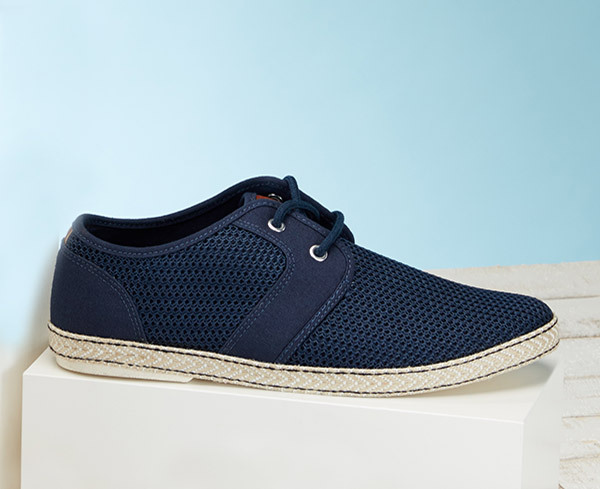 With their rope sole, espadrilles are one of the most instantly recognisable members of the footwear family. 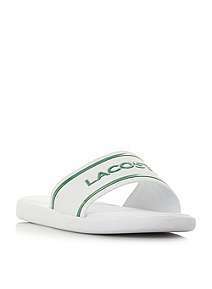 They date back to the 13th century, originally made in the Occitania and Catalonia regions of France and Spain, with the name deriving from ‘esparto’, the plant originally used to braid the soles. 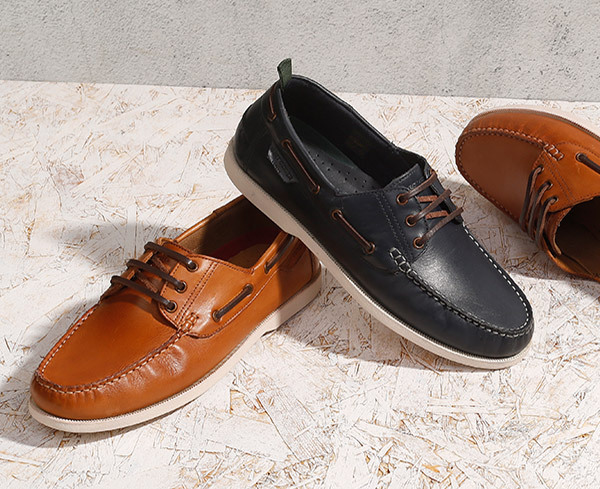 In some ways they’re the perfect solution to summertime footwear: cool and light while also smart. 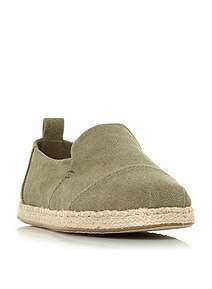 Equally good teamed with tailored shorts as with jeans, they might just be the only shoe you need to pack come holiday time. Before we say anything else, don’t be fooled into thinking moccasins are slippers. 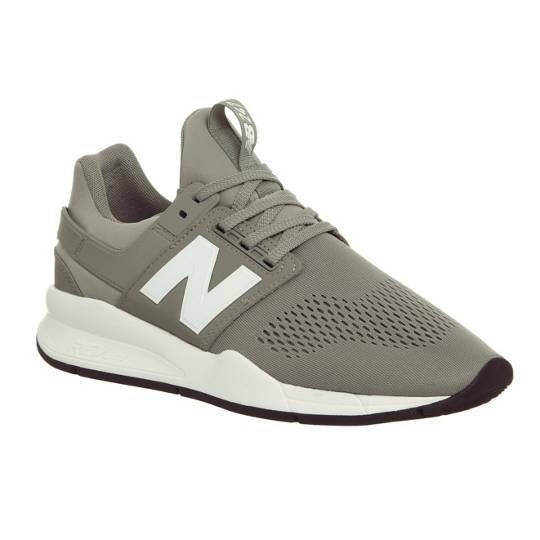 They may be the comfiest summer shoe you’ll ever own, but they’re also sophisticated. While they originated from the tribes of North America and were originally made from various hides, today, they've become the go-to occasion shoe. 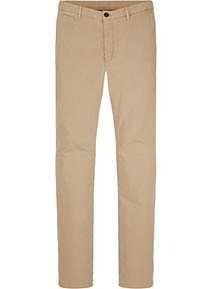 They’re ideal for work and summer dos when paired with slim-fit chinos or light-coloured suits. 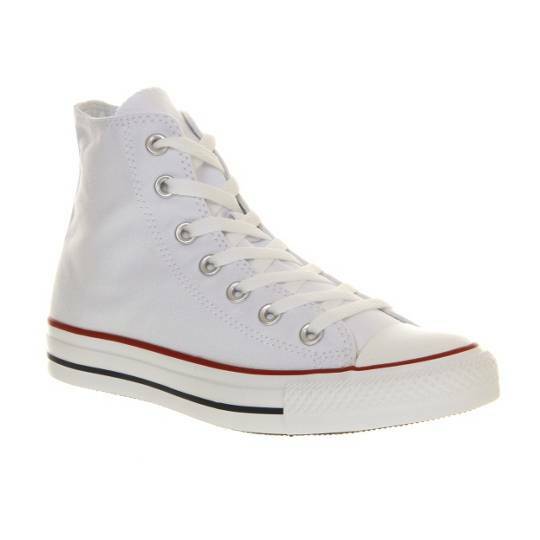 Alternatively, use them to make a statement by choosing a colour-popping pair worn with jeans turned up. Whoever said style couldn’t be comfortable? If there’s one shoe that gets us in the summer spirit, it’s the boat shoe, and for this, we have one man to thank. In 1935, Paul Sperry invented a shoe with a moccasin upper and a slip-resistant rubber sole inspired by his dog’s paws to stop himself slipping on the boat deck. These days, they’re associated with style and elegance, think Hollywood legends sipping cocktails on a yacht in St. Tropez. 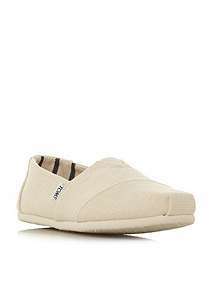 Wear with rolled up chinos, a tucked in shirt and a golden tan. 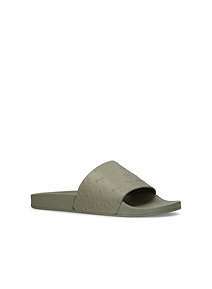 Sandals have something of a long history, with the oldest pair ever found thought to be 10,000 years old. They’ve had their fair share of bad press, but in 2018 they’ve become cool once again. Channel geek chic and pair with socks, go for utility and team with cargo trousers or keep it classic with dark, tailored trousers and a tee, sleeves rolled up. 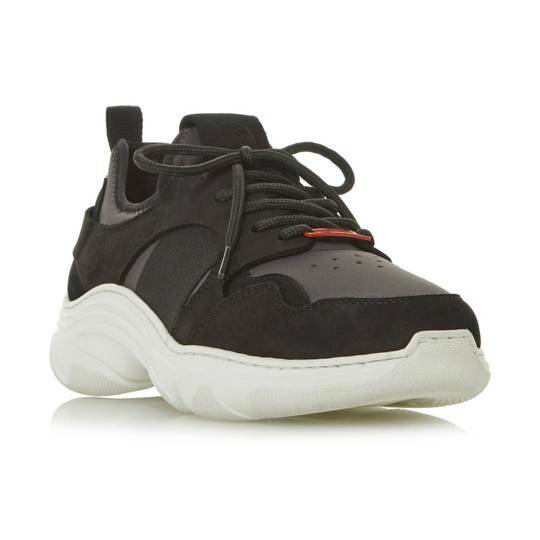 It’d have been pretty hard to miss the chunky trainer trend, but even harder to miss are the shoes themselves whereby the rule is the more bulbous, the better. We wholeheartedly approve. 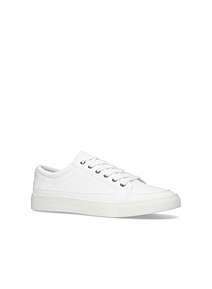 If you feel lost in the sea of excellent minimalist sneakers, let us intro you to these ones which we are almost 100% sure will go with everything your current and future self will own. 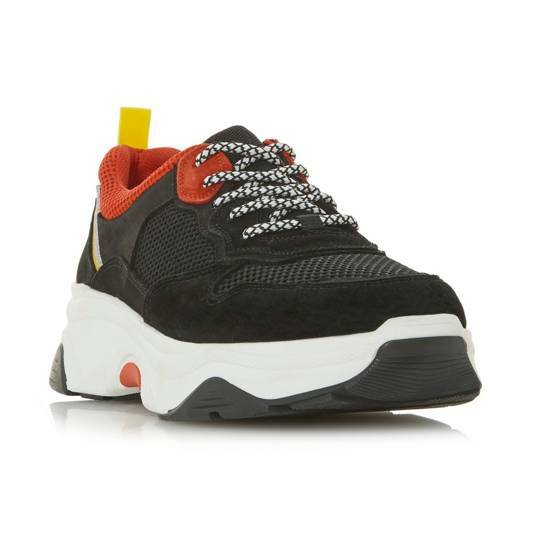 Ugly trainers continue to be a key trend and this pair with its pops of garishness and beefy construction are a thing of beauty. 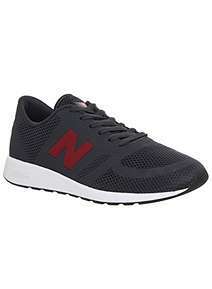 Universally loved for looking – and feeling – great, New Balance are a crowd-pleasing sneak if ever we knew one. Anime is officially a trend and nowhere is it more appropriate to channel than in a pair of trainers worthy of their own manga character. 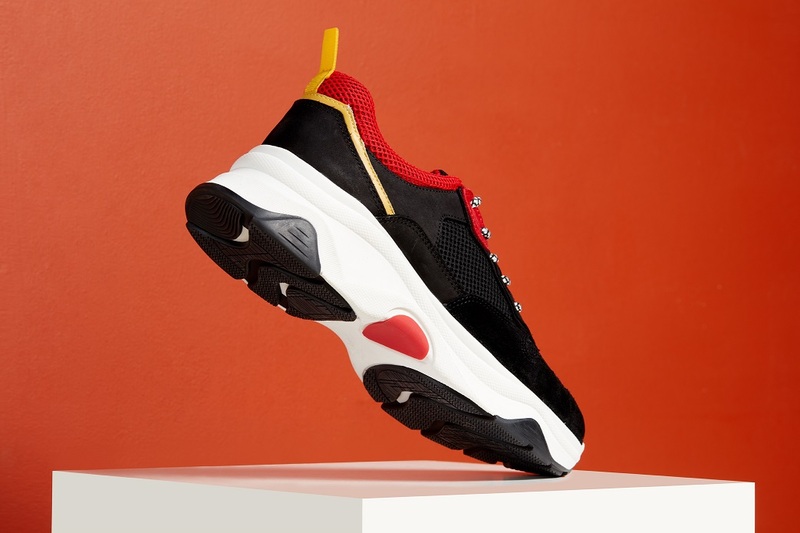 These are the kind of trainers your friends will casually ask where you got them from, pretending like they know already, while at the same time frantically scrolling on their iPhone to snap them up themselves. 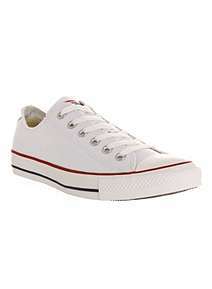 ‘If it ain't broke, don't fix it,’ as the saying goes, which feels almost penned for this particular iteration of Converse, which has stood the test of time from basketball courts to Instagram feeds. 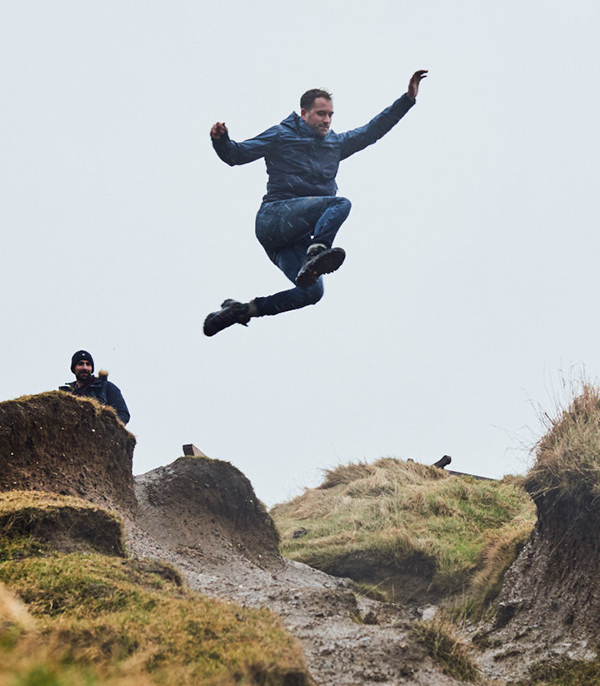 Hiking shoes have waded their way over to the trainer arena, giving us new kicks with tough laces and constructions worthy of hillside jaunts (or Tube line dashes). 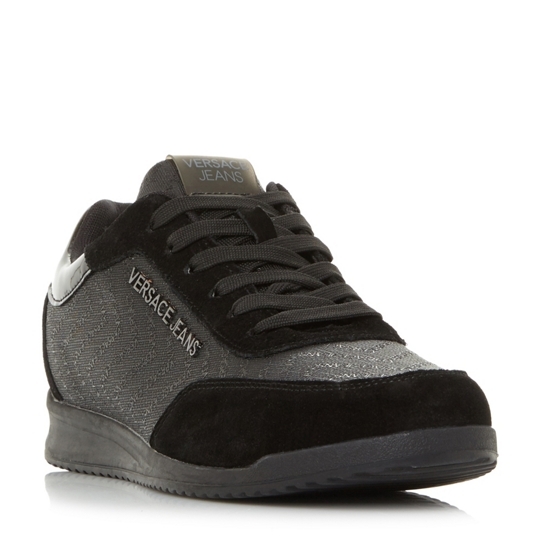 Combining comfy textures and a pleasingly toothy sole, these trainers hit many a trend button in one deft move. 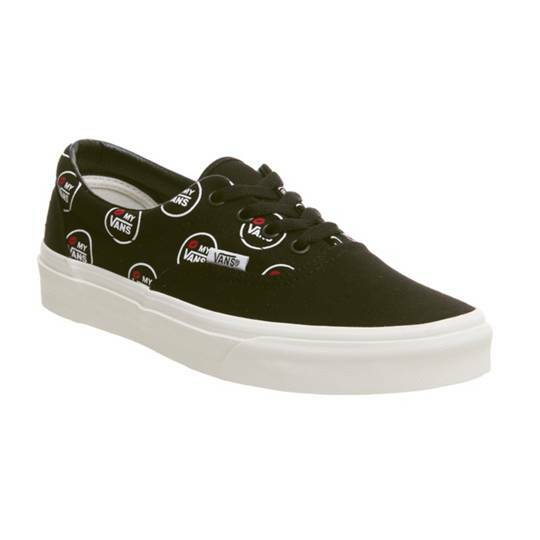 Revamping a classic shoe into an of-the-moment opinion divider is precisely what Vans have done here. “They’re a bit out-there,” you say, secretly adding them to your basket. You’ve booked the trip, now what to pack? A successful holiday wardrobe can be something of a mirage: everything seamlessly goes together, everything works, nothing’s missing. The trick? A streamlined capsule packing list that is carefully thought out. Put these 12 items in your case and as soon as the out-of-office is on, you’re ready to jet-set. You want to take a selection of great tees. Make sure one of them is standout enough to add interest but simple enough to go with a multitude of bottoms. 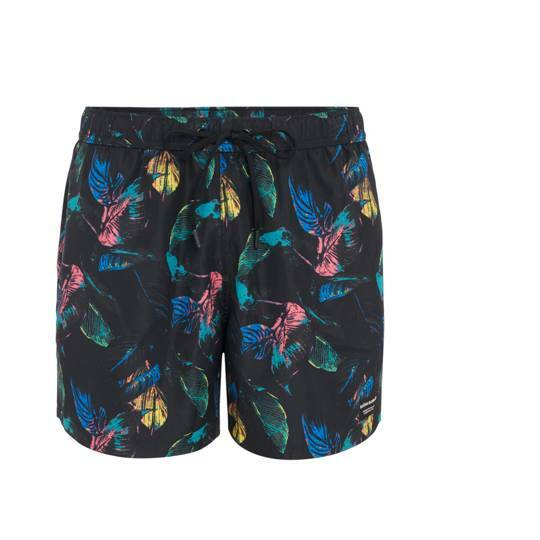 Look for versatility in the shorts department. A tailored chino pair will look equally at home in the city gallery as by the hotel pool. 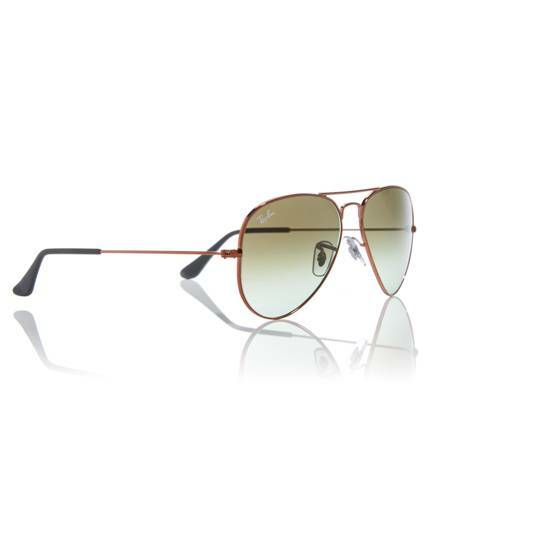 James Dean, Steve McQueen… take inspiration from the greats and make sure you’ve got a great pair of aviators for vacationing. On holiday you want minimal fuss, right? Guarantee yourself less time stressing and more time enjoying by choosing swim shorts you don’t need to change out of when the sun goes down. 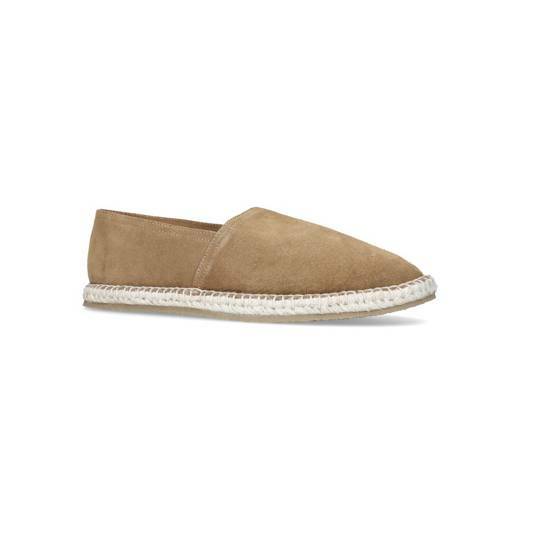 The award for the most hardworking summer shoe most certainly goes to the espadrille; cool beachside and suave in the city. 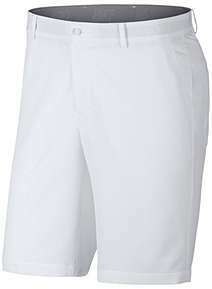 If the weather doesn’t play ball, you might need some trousers. 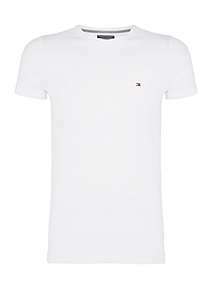 Effortless and nonchalant, wear light chinos rolled up with a tee come day and rolled down with a shirt come evening. We know, we know, the last thing you want on actually leaving the office is to put on a shirt. But a crisp, breezy shirt is a whole different ball game. Want to pack as much into your bag as you do a holiday? A cool backpack is what you need. Khaki jacket, white tee and stone trousers… dream combo. Pull out for your airport look and more adventurous holiday gallivanting. 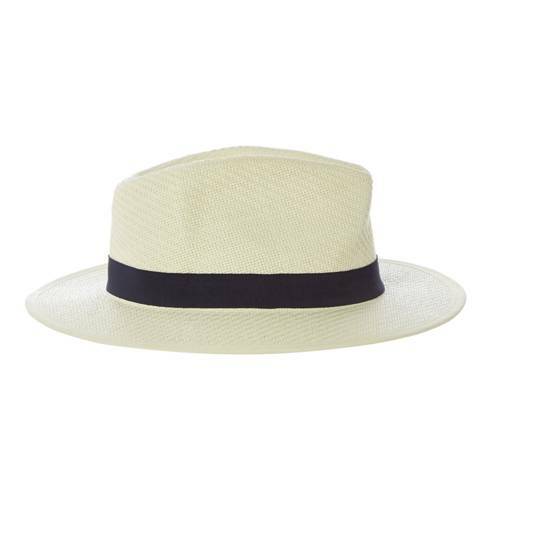 Ward off the sun’s rays with decided sophistication courtesy of a Fedora. 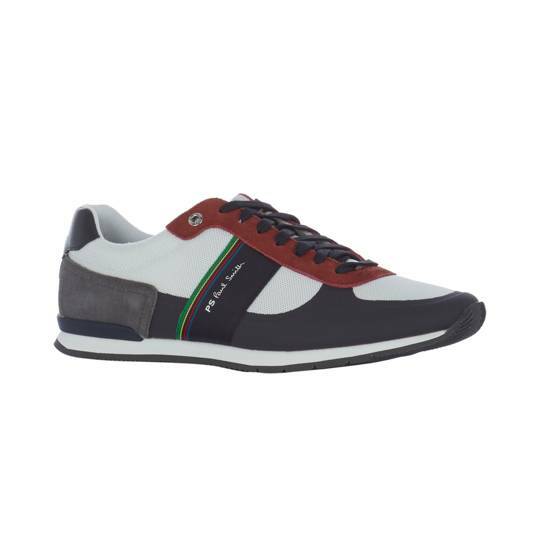 Travelling and sightseeing requires some sturdy trainers. 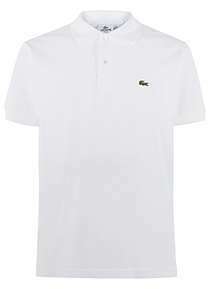 White will look effortless with the rest of your summer gear. 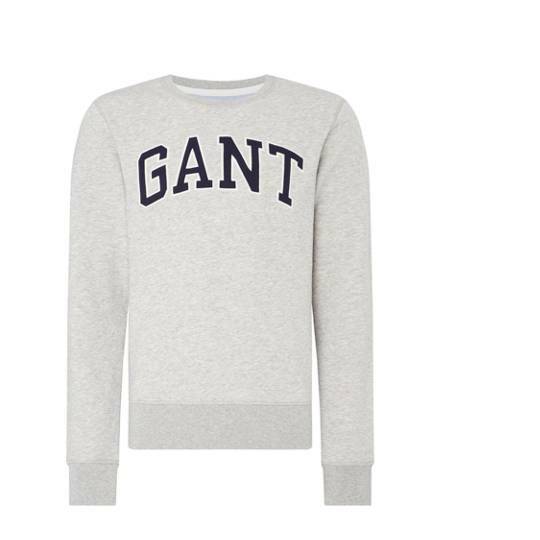 Make sure you’re not caught out with a light sweatshirt you can throw over your ensembles. We’ve got our eyes on this one. 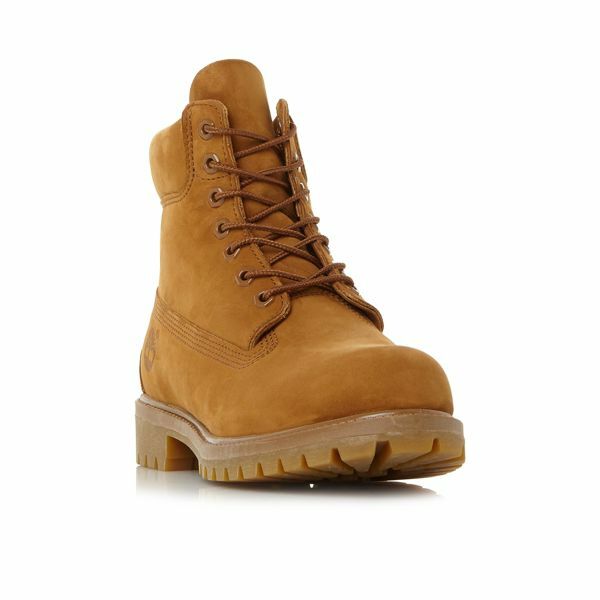 Alongside Sunday roasts and guilt-free Netflix binges, autumn also brings the opportunity to invest in a brand new pair of boots. 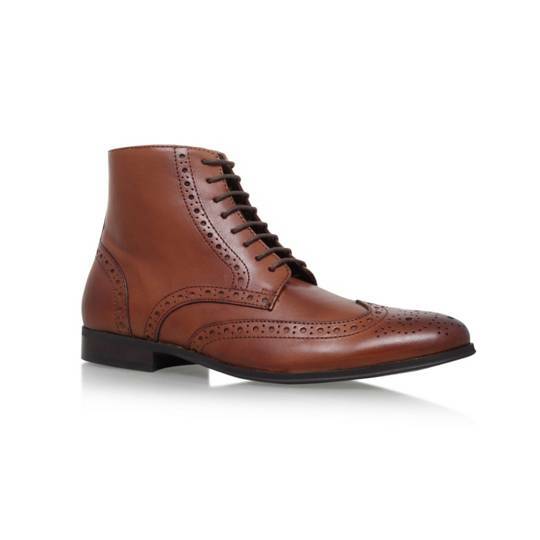 The most hard-working shoe in your wardrobe, a smart boot purchase can take you all the way from autumn to spring, via pub lunches, snowy commutes and a fair few knees ups. 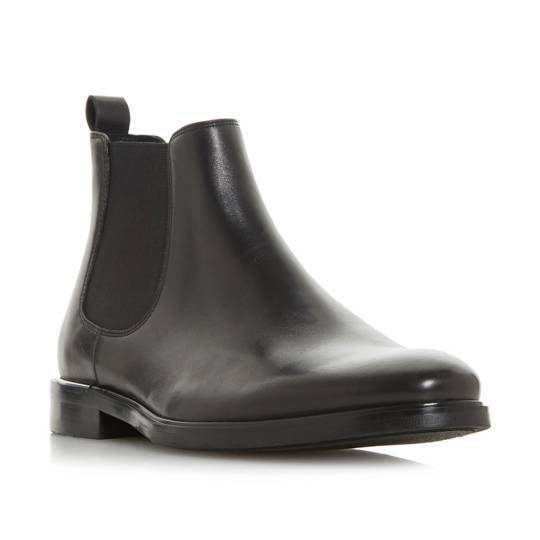 From classics like the Chelsea boot to the season’s hottest hiking boot trend, we’ve picked ten of the best to invest in this year. 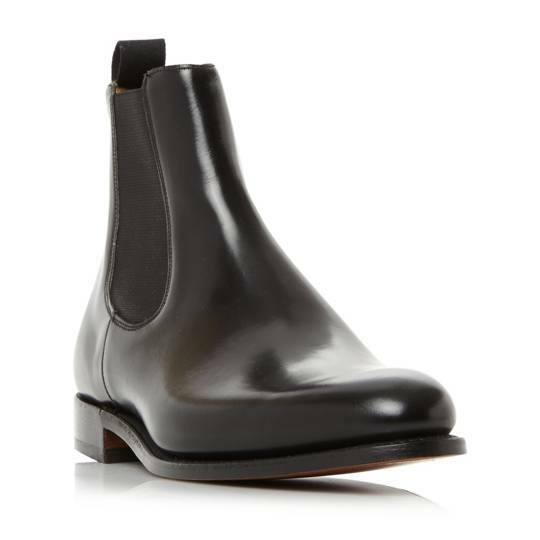 Oh, the Chelsea boot. 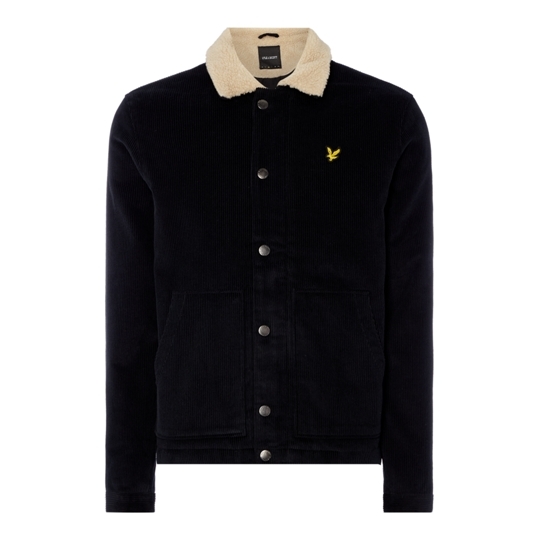 A style icon for decades – think 60s mods – it’s still a firm favourite in our eyes. 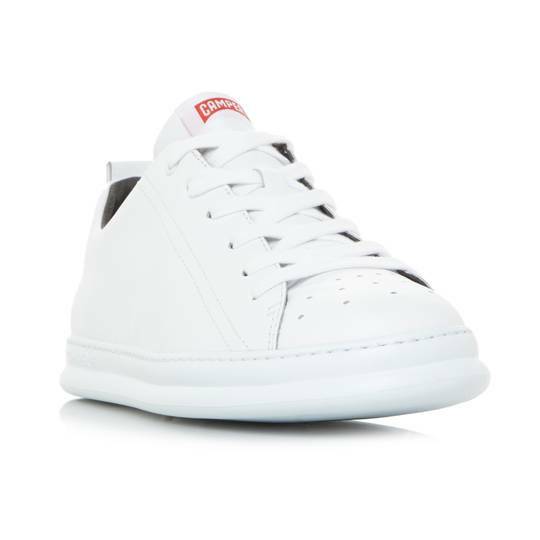 Nab yourself a classic but modern pair, like these beauties from Kurt Geiger. 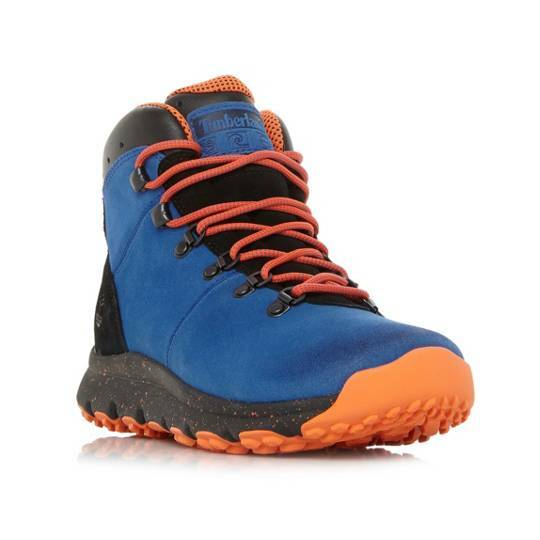 Hiking boots are the key boot for this season. From Louis Vuitton to Giorgio Armani, they were sported all over the catwalks. The shoe you once wore for your mountain jaunt is now your daily get-up. We approve. 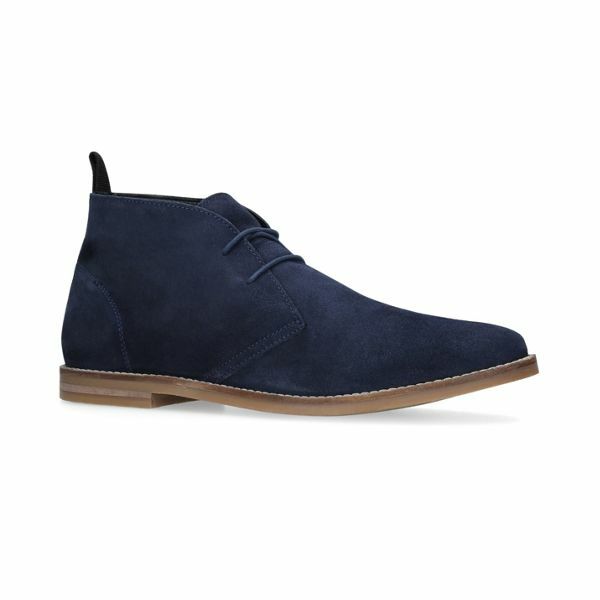 Inspired by the boots WWII soldiers wore in Egypt, today’s desert boots are ideal for colder climes. 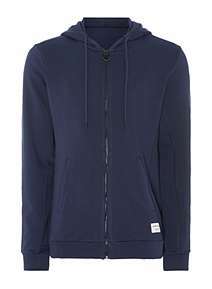 Minimal and sleek, play with colour and choose a navy version for office or off-duty dressing. 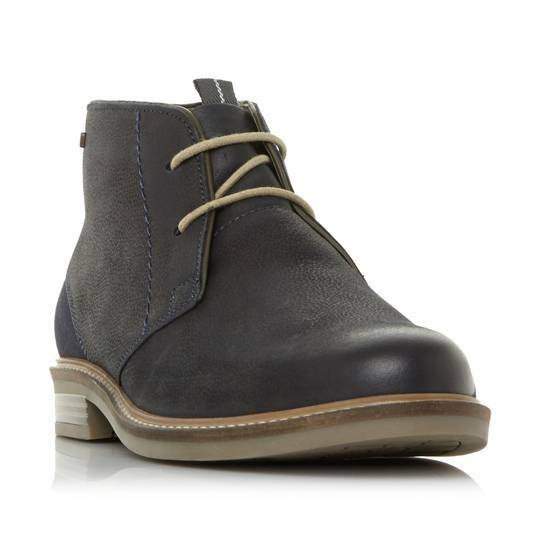 We feel a lot of affection for the chukka. 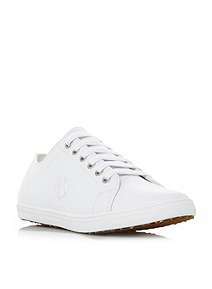 The thin laces and simple, sleek style is minimal on fuss, max on versatility. Not got these in your repertoire? Get them in there pronto. Yes, boots can be smart. 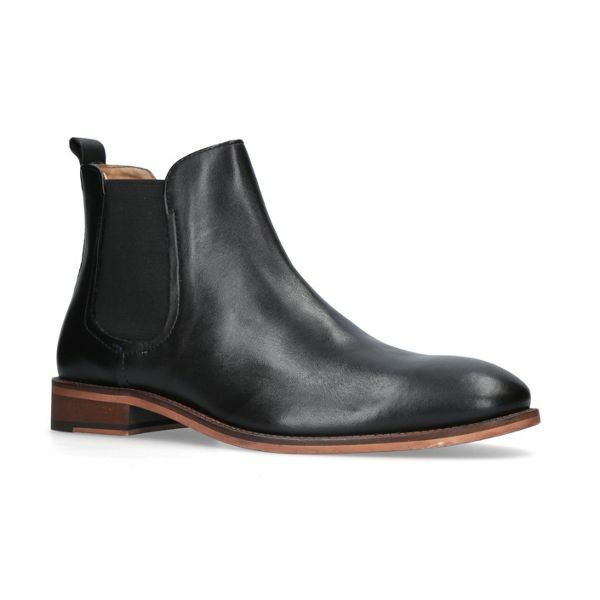 Pair polished Chelsea boots with slim black trousers and a pea coat for dinner, or with a suit – keep the leg slim and cut to show off the shoe’s shape – for fancier affairs. 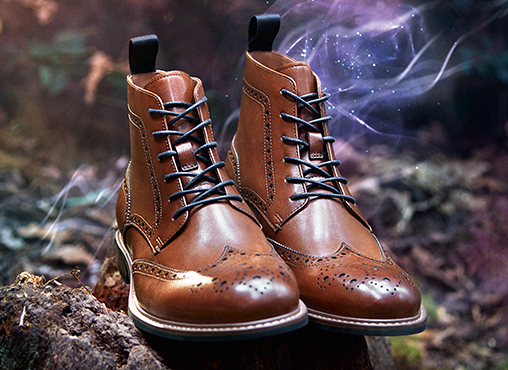 Brogue boots occupy that happy middle ground, being both rugged and gentleman-esque at the same time. They’re as good with jeans as they are a suit. Sometimes feel the need to channel a bit of Beckham in Belstaff? Us too. 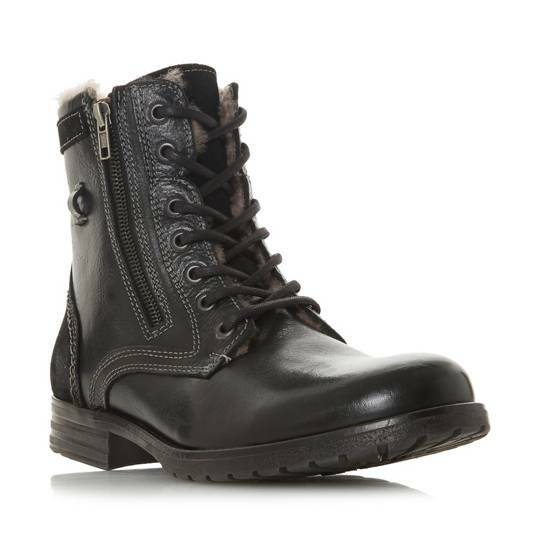 Put on some biker boots and you’ll be prepped for anything winter throws at you. 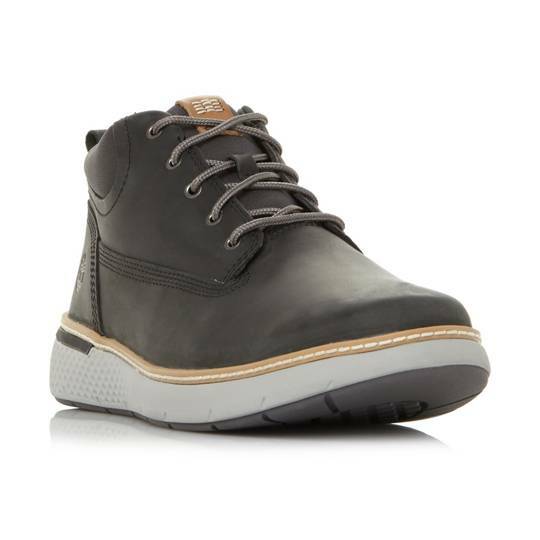 Timberland’s 6 inch chukka boots are something of an icon. Always cool, they take on new relevance this year with fashion’s protectionist, weather-beating mood going on. Is it a boot? Is it a shoe? 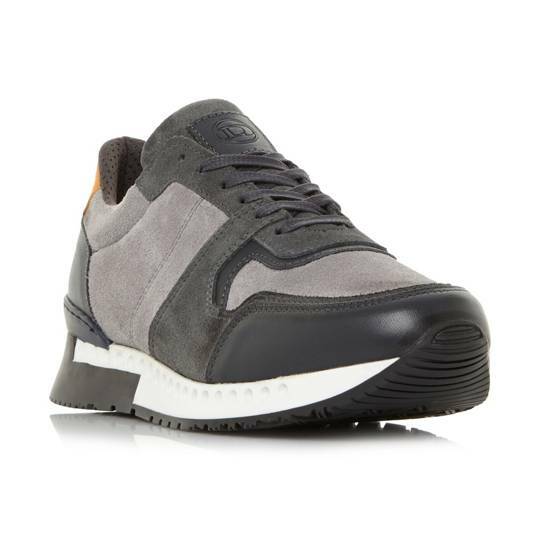 Happily confuddle passers-by with a trainer-boot hybrid that’s ideal for warmer autumnal days. We often approach January with a guilt-ridden sense of duty. It’s pretty cold, pretty depressing and we don’t really want to pay for that gym membership. This year, however, we’re saying no to the things we don’t want to do and yes to the things that make our heart beat. From that hobby we want to rekindle to reclaiming our lunch break, here are some ideas on how to make January great again. Join us, if you will, on our crusade to make this month the best of the year. Make the UK your bucket list. From stargazing in Northumberland’s International Dark Sky Park – the largest area of protected night sky in Europe – or hanging out with Britain’s only free-grazing reindeer herd in the Cairngorms, explore what’s on your doorstep. Embrace the things that get your pulse racing. Try wreck diving in Orkney, canoeing in Strangford Lough – one of the locations for Game of Thrones – or scaling Scafell Pike, England’s highest mountain. Take on a digital detox and turn off your social channels for a week. Reclaim back your lunch hour and use it to go for a run or explore the local area. Cut yourself some slack and make time to intentionally rest this January. Coach a youth sport, cook for a neighbour, volunteer with a refugee charity or support a ‘haircuts for the homeless’ project. 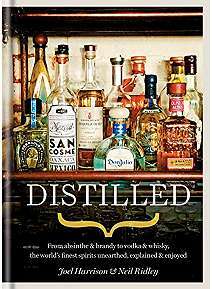 Brush up on a language or take up a course – think charcuterie, glass blowing or gin making. Read the classics you’ve always wanted but never got round to. Start a side hustle or get really good at something you love. Set yourself a challenge like seeing how far you can travel on £10 or go vegan for Veganuary. Wear that item of clothing or brand before everyone else, visit a restaurant’s soft launch or get the app before it becomes big. Visit Plovdiv, Bulgaria, one of the two 2019 European capitals of culture, the Belize barrier reef or the beaches of the Andaman and Nicobar Islands. Buy local for a week, stand up for something you believe in, donate to that crowdfunding campaign or leave an outrageously large tip for service you admire. Write a letter, book in time to call an old friend or visit the person you’ve said you would but never got round to. They’ll thank you and January will feel all the better for it. The 14 days when all eyes are on SW19 have finally arrived. Surely the most glamourous sporting event in the UK, Wimbledon is as much about what the spectators are sporting as the sport itself. Heading there yourself? 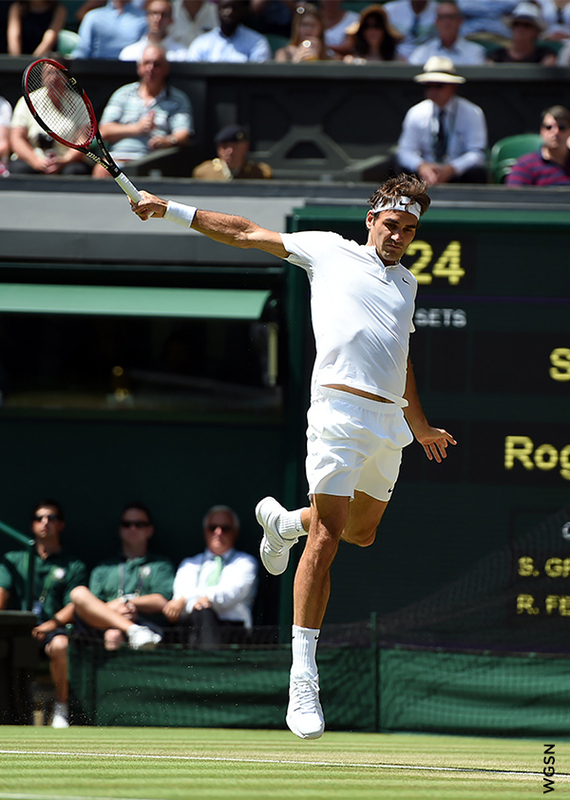 Here’s how to pull off Wimbledon dressing with flair. If you’re heading to Centre Court, you'll want to look effortlessly put together, without any indication you’re trying. 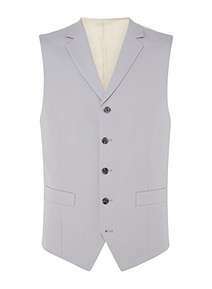 Think light-coloured summer suiting in creams, light blues and greys. 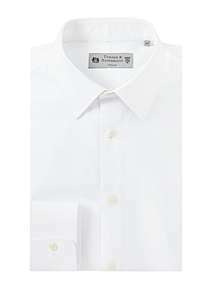 Go for a subtle, heritage check and tone down the smart level by switching your shirt for a slim-fit white tee. Alternatively, play with your pairings. Team your neutral suit jacket with navy trousers and a spotted tie, or a pastel pink or sea green blazer with dark chinos and a white shirt and leave your tie at home. 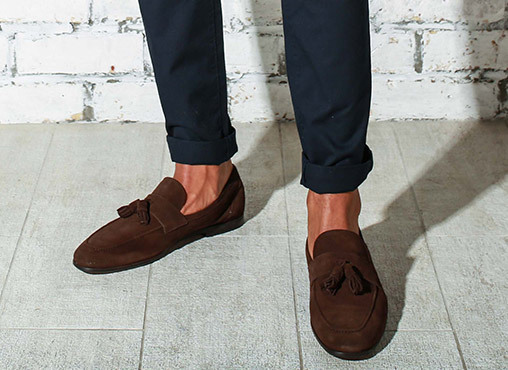 When it comes to your footwear, pick Oxfords, suede Derbys or loafers. Got ground tickets? You can afford to have a bit more fun. 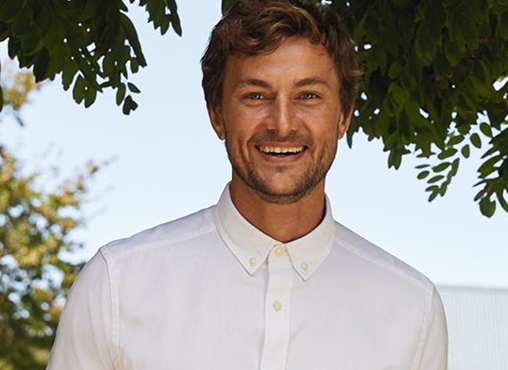 A short-sleeved shirt in a ditsy print teamed with chinos or white jeans – a la Joe Swash last year – and loafers will get you on the best dressed list. 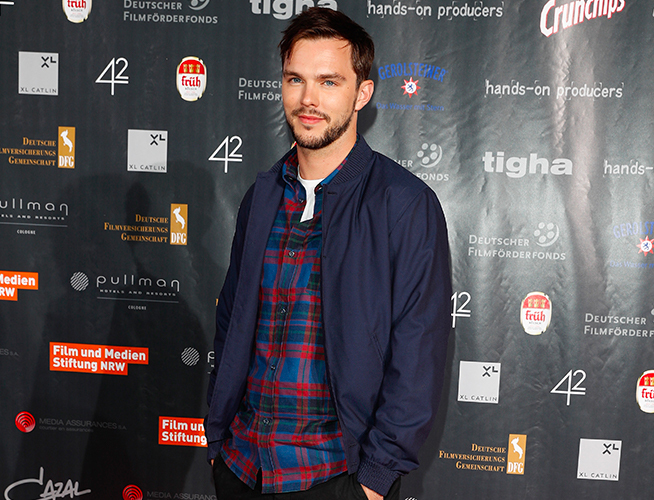 Otherwise, go for that failsafe combo of mid or long tailored shorts and a striped tee. 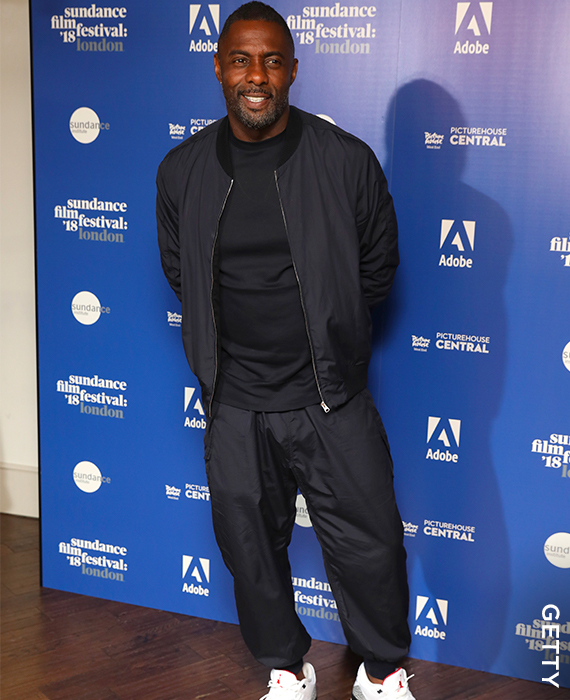 Keep it suave though – Pimms and baggy sweats don’t mix so well. Time to refresh your style? Look to Linea for around-the-clock staples, Turner & Sanderson for city smart, Label Lab for urban street style, Criminal for trend-led swag, and Howick for preppy weekend wear. We’ve got it covered – basics and beyond. The first switch in transitioning from winter to spring is the coat. Pack away your heavy outerwear and slot a perennially cool bomber, rugged trucker or smart/casual mac into your repertoire. For knitwear, turn to lighter colours and thinner, breathable weaves. 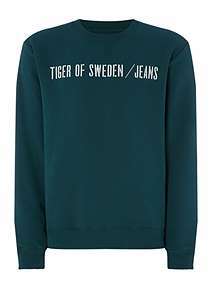 Equally, sweatshirts come into their own in spring as the ideal middle ground – perfect on their own or layered under a jacket. 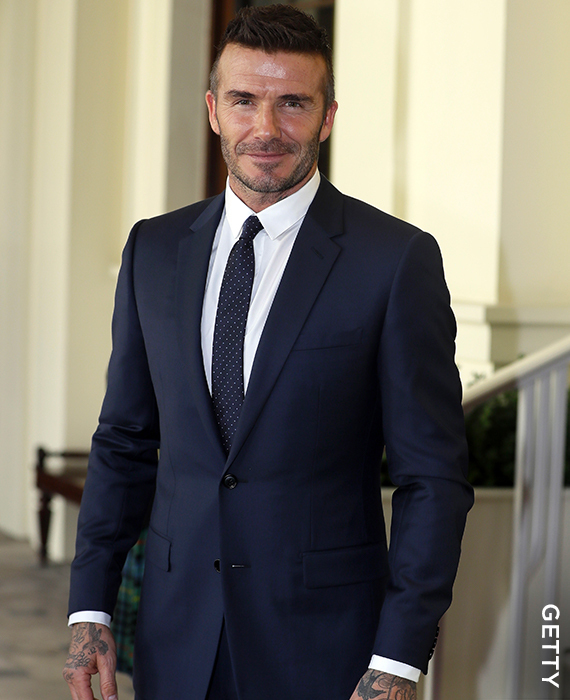 Let David Beckham be your guide for successful spring dressing. Want to know how he does it? Paul Hayes, Menswear Senior Buyer at House of Fraser, decodes Beckham’s look: “The master of layering has a wardrobe of relatively staple items that he twins with designer items. This formula makes that old T-shirt or well worn pair of jeans look brand new.” For in-between weather, he’ll wear a T-shirt and beanie, or denim shirt layered under a light safari jacket. 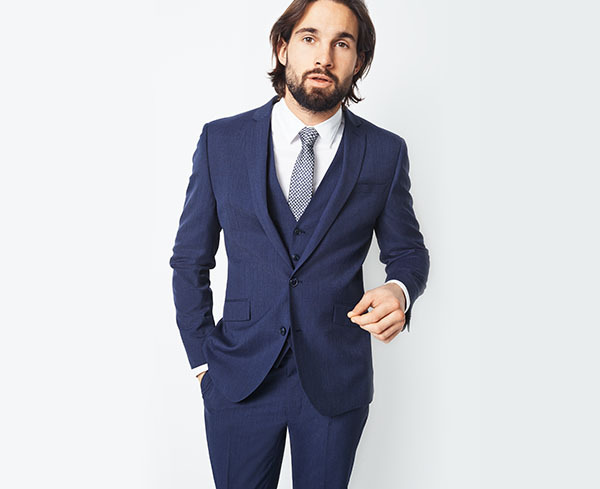 There's some good news for your working wardrobe, as one of the biggest trends for SS18 is a fresh new take on suiting. But this time around we're looking at a beautiful rainbow of colours, from dusty pink to electric blue. Office codes are also changing. Spring – with all its new season optimism – gives you a chance to mix it up. 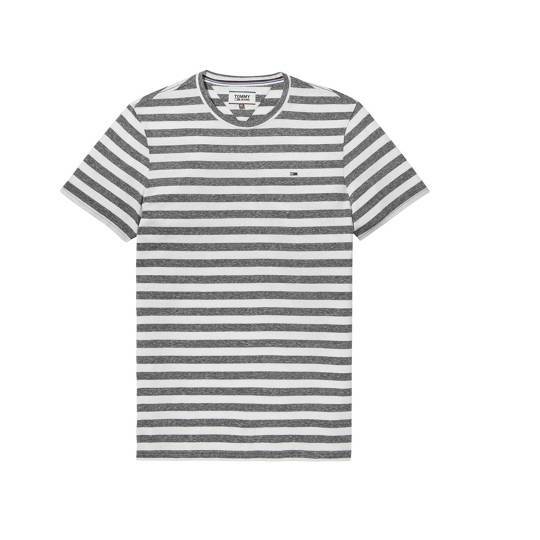 Change your shirt for a striped tee, wearing with your suit blazer, trousers and trainers. 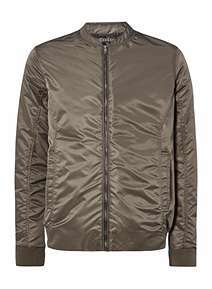 Wear subtly patterned shirts with khaki trousers, or go for a luxe bomber and chinos. "For an evolving wardrobe without the footballer price tag, choose contrasting colours from the same palette,” advises Anita Ross, Personal Shopper at Jenners, Edinburgh. Blue with subtle accents of orange or yellow, for example, is always stylish. 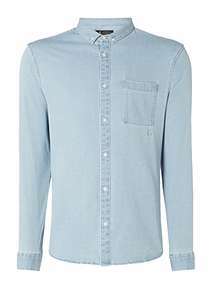 Try introducing pattern and colour into your wardrobe through statement tees and pastel Oxford shirts. A few simple changes can breathe fresh air into your outfits. 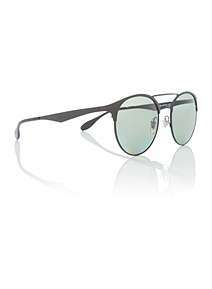 Swap cords for jeans, boots for trainers and scarves for aviator sunglasses and buy items that can work just as well for weekends as they will for smart-casual, from chinos to shirts.